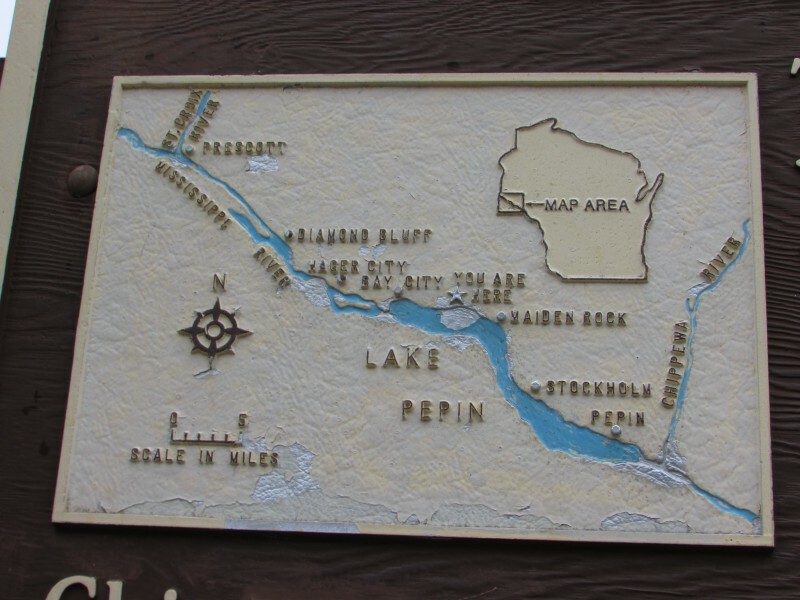 We crossed the bridge from Minnesota to Wisconsin from the Minnesota Great River Road and soon we were in Pepin. 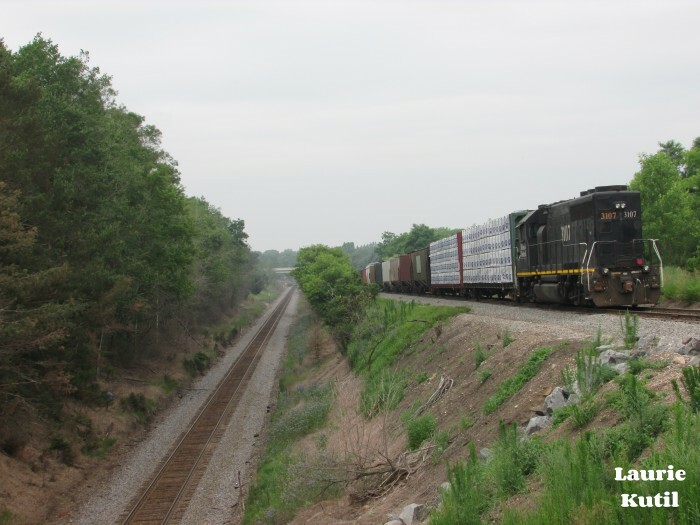 This railroad community is a village of 837 on the shores of Lake Pepin (which is really a wide part of the Mississippi River) has many friendly people that we met and enjoyed talking to. 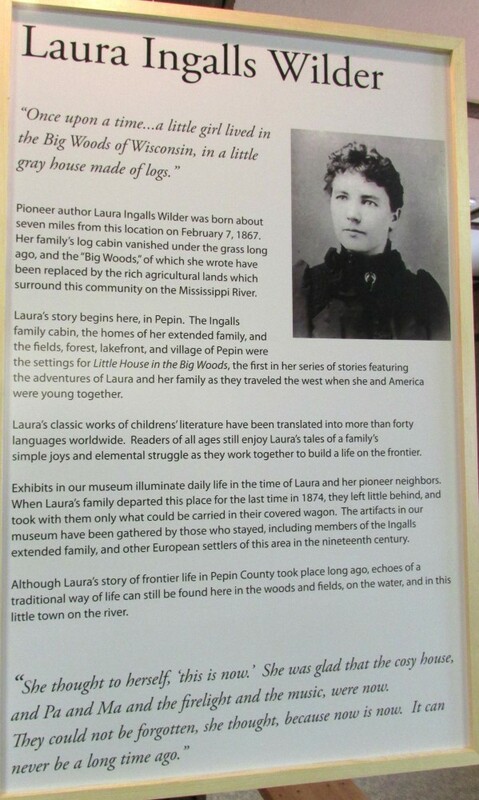 Pepin’s most famous residents were Laura Ingalls Wilder and her family in the late 1860’s-early 1870’s. 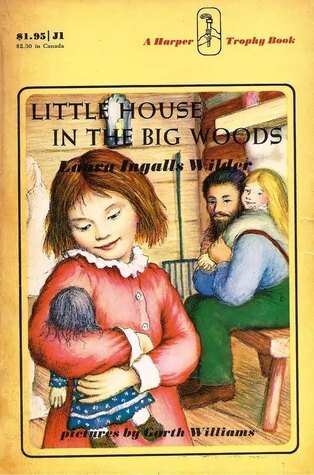 Her first book “Little House in the Big Woods” takes place here. 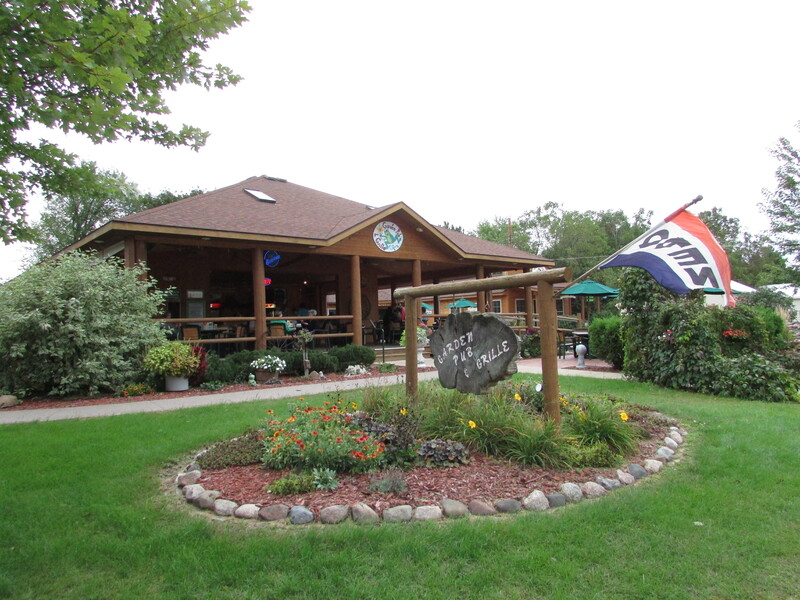 We first had lunch at the open-air Garden Pub and Grille. What a friendly and fun place! Just bundle up when the weather is cool. 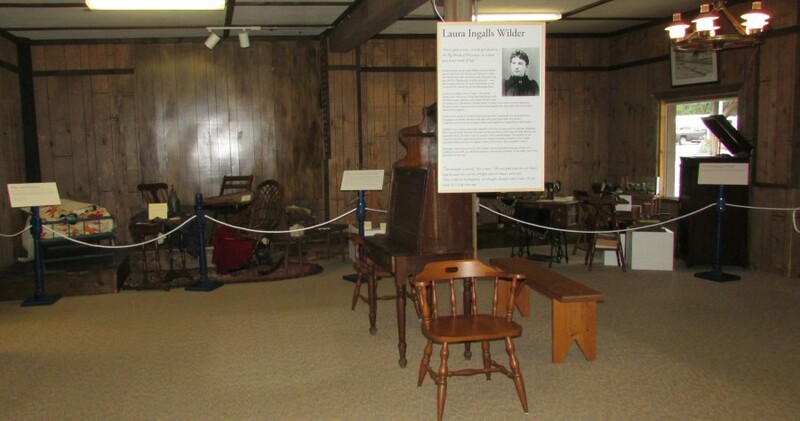 After lunch we went back to the 1870’s with a visit to the Laura Ingalls Wilder Museum. 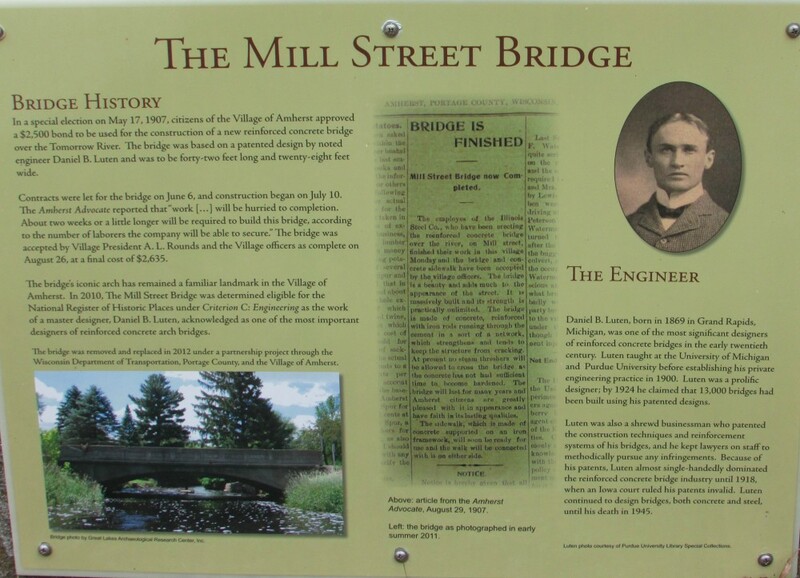 She was born in this community in 1867 and they have never forgotten it. 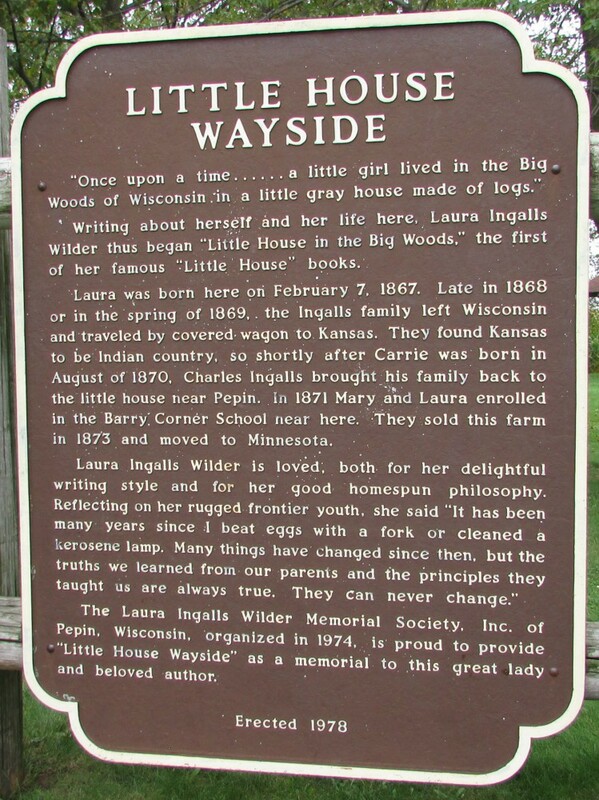 The 2nd weekend in September the town has a Laura Ingalls Wilder Days festival, we had just missed it. Here is a video of the festival from 2012. 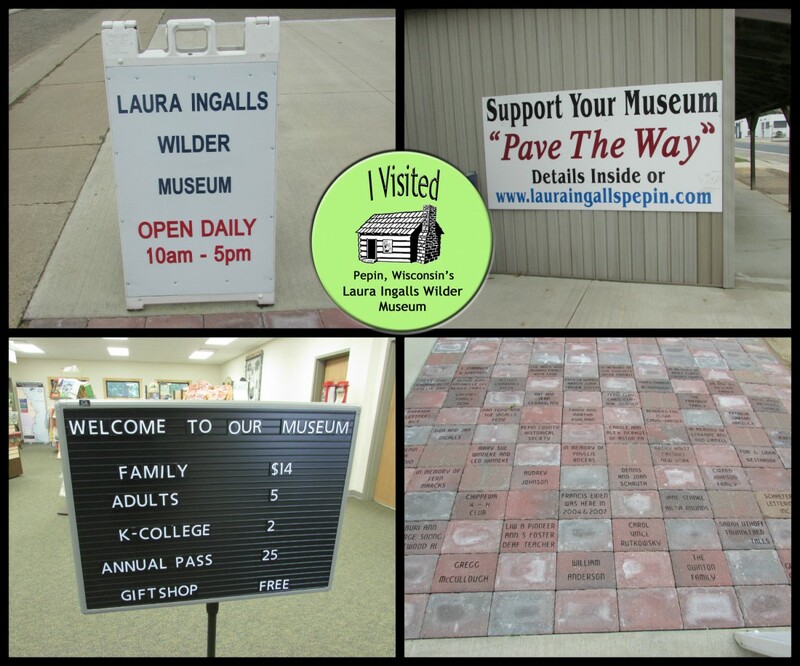 In front of the museum is a group of pavers engraved with names of people who donated to support it. Pave the Way is the name of their fundraiser and you can donate here. We went in and saw a great many displays depicting life in 1800’s. 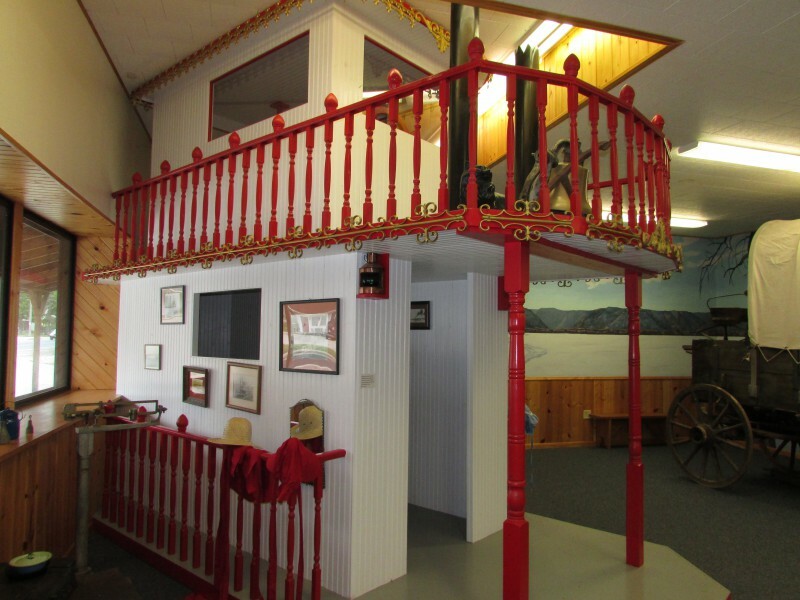 In the transportation room was a steamboat model that kids could go to the top and pretend to steer it. Boats were especially important for commerce before the railroad came. 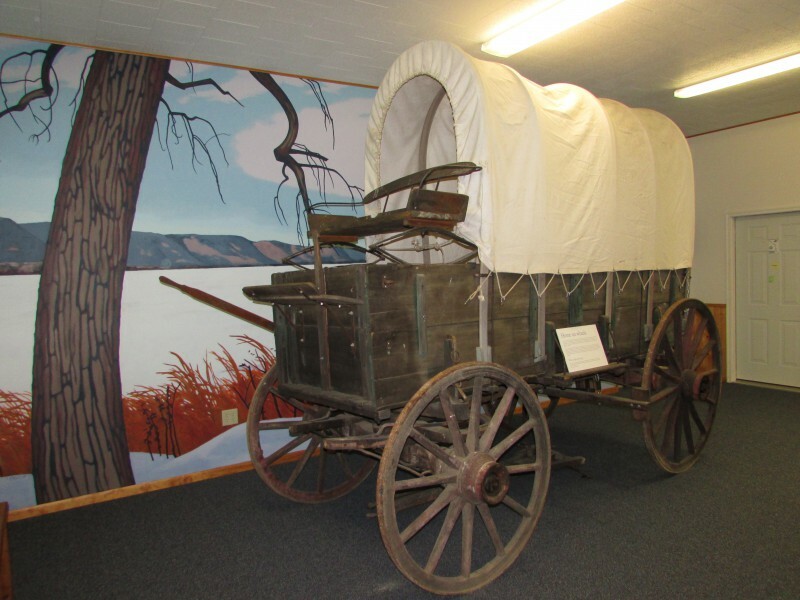 Also a covered wagon which families traveled in as they settled the country. 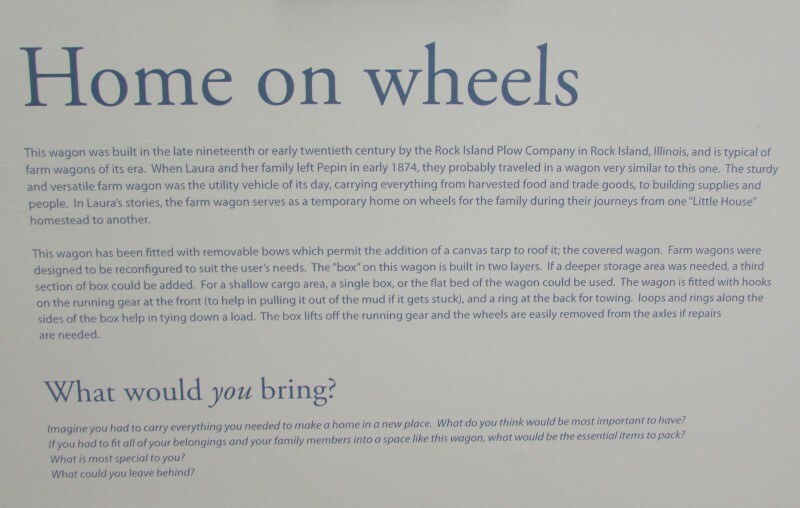 The first mobile home! 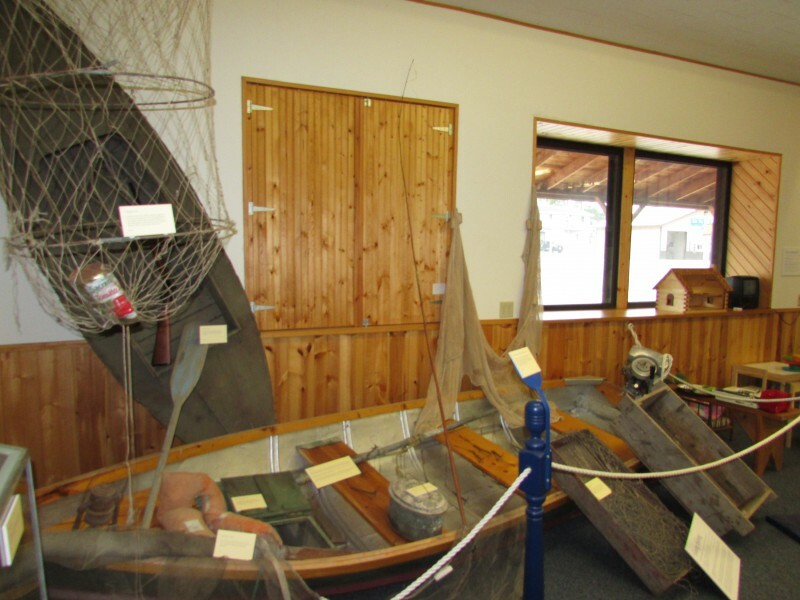 Also fishing boats and tackle used in the late 1800’s. 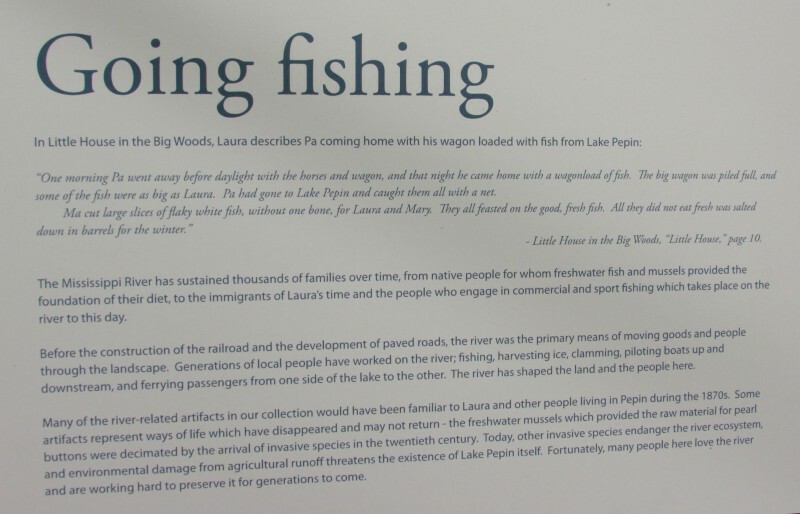 Laura’s father caught fish on Lake Pepin to provide for their family. There was also a pearl button industry here too before the invention of plastic. 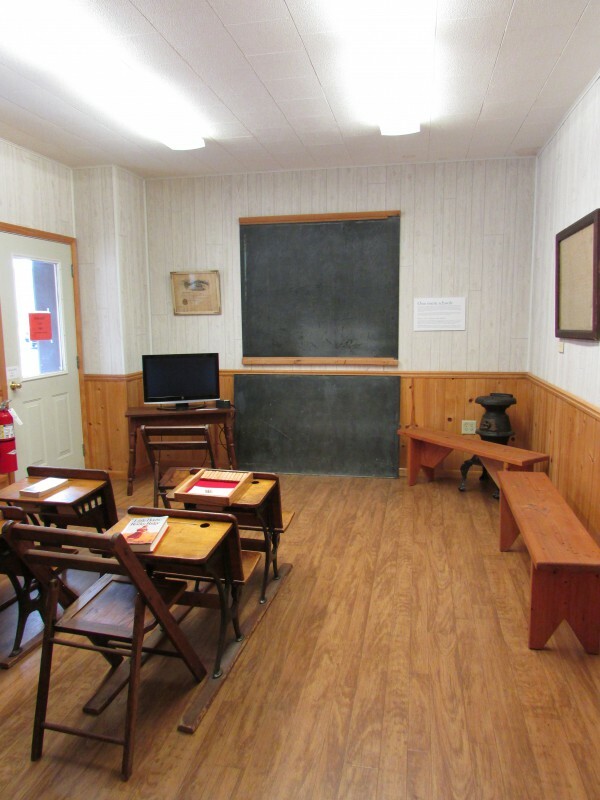 Just behind the Transportation room is the One-Room School room. The TV in the corner plays a slideshow of what Pepin was like when Laura lived there. It show photos of her parents Charles and Caroline (who originally from Brookfield, WI!) Also Grace, Mary and Laura (L-R). 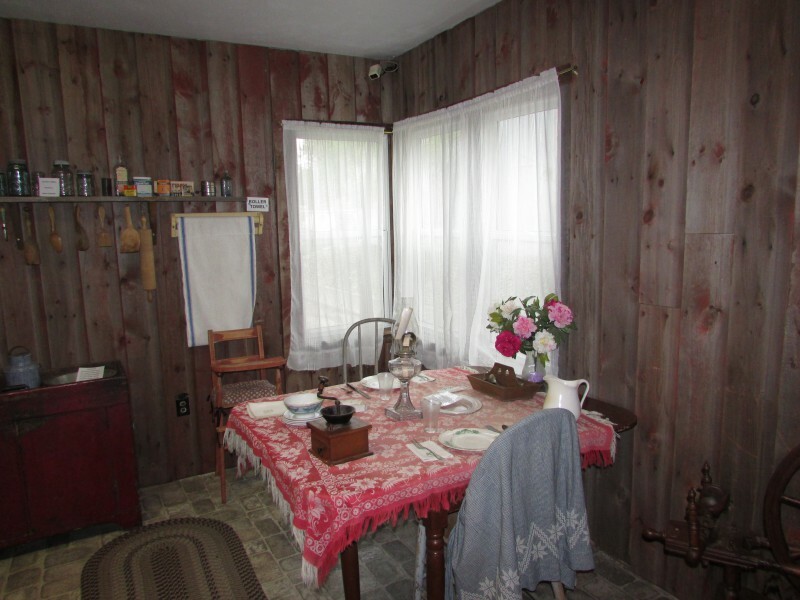 On the other side of the building were the home life displays and a few family artifacts or friends of the family. 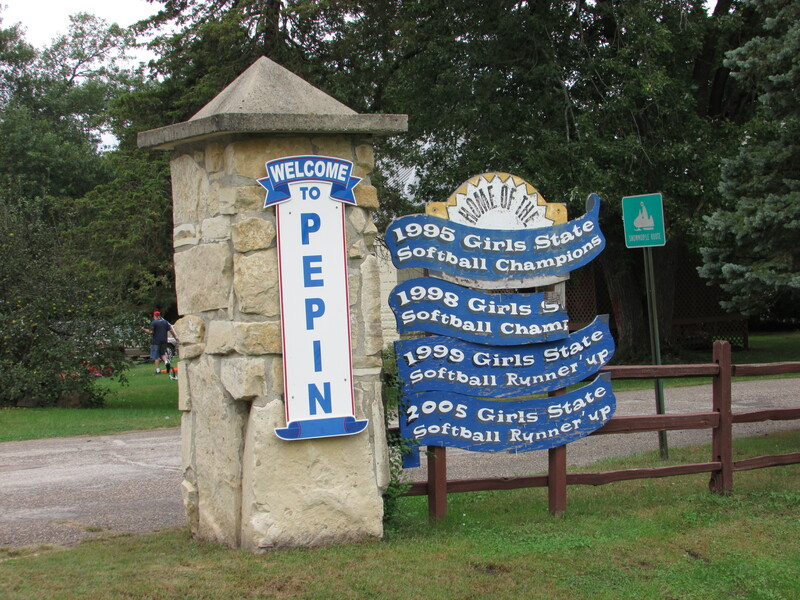 Most were contributed by residents in the Pepin community. 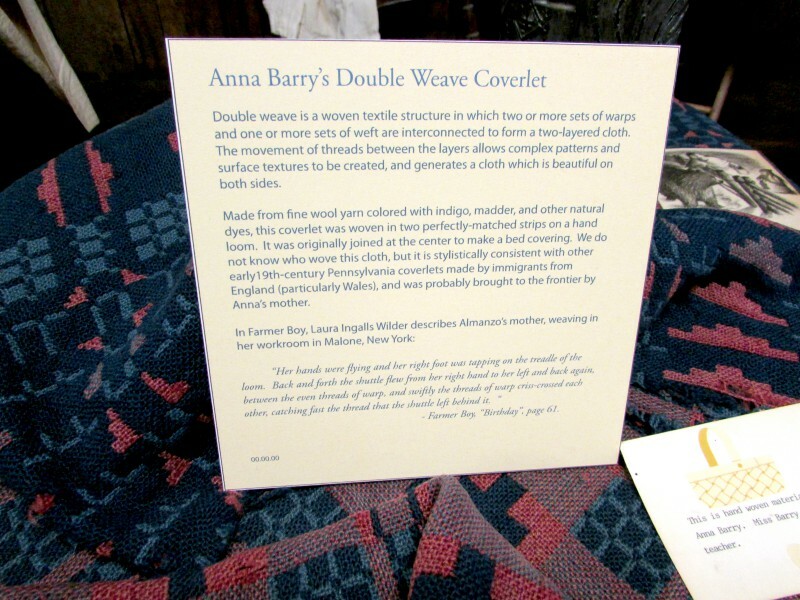 Featured is a coverlet similar to one Almanzo Wilder’s mother might have made on her loom. 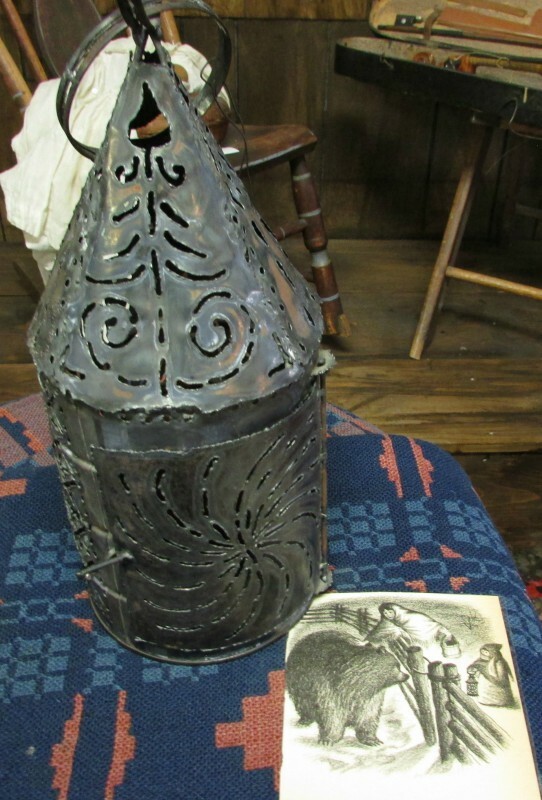 Also on this table is a tin lantern similar to what Ma (Caroline Ingalls) used when she went out into the winter night and confronted a bear! 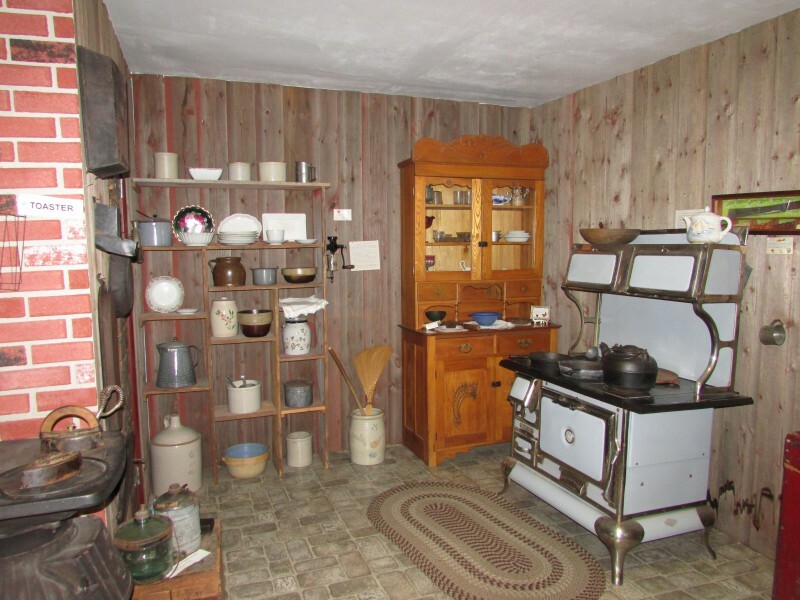 There was also a kitchen display at the museum too. 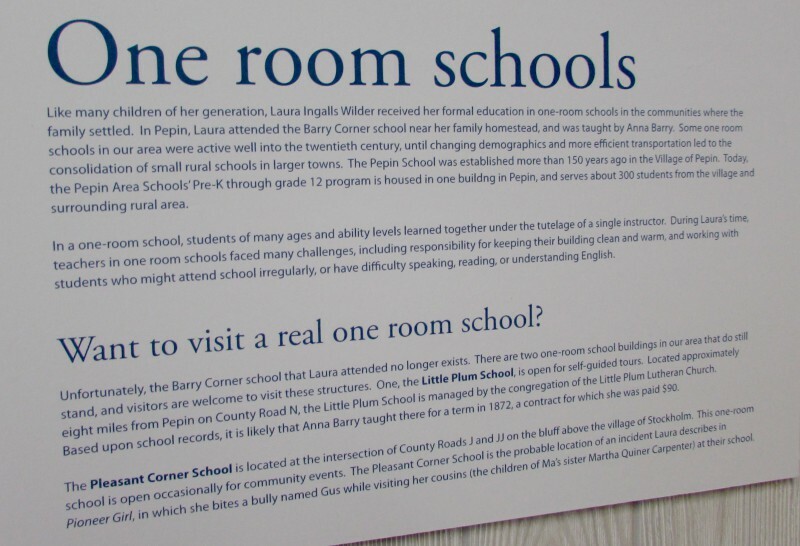 A sign about Laura in the museum. We had a great visit here, it’s worth it to get a gift from their large gift shop. 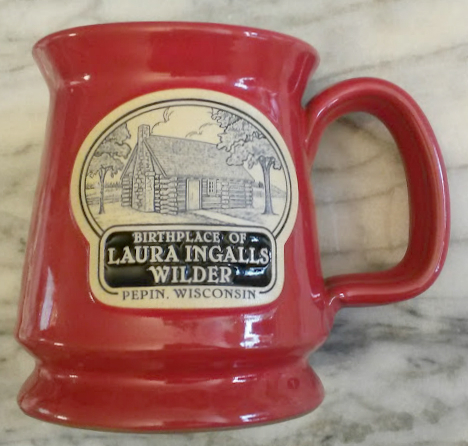 I got this stoneware mug made by Deneen Pottery in St. Paul. 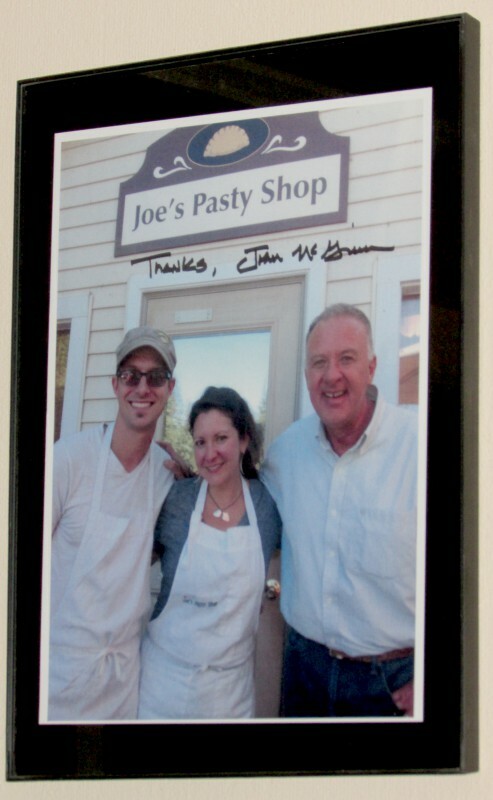 What a great memento of our visit here! This wasn’t all in Pepin to see. 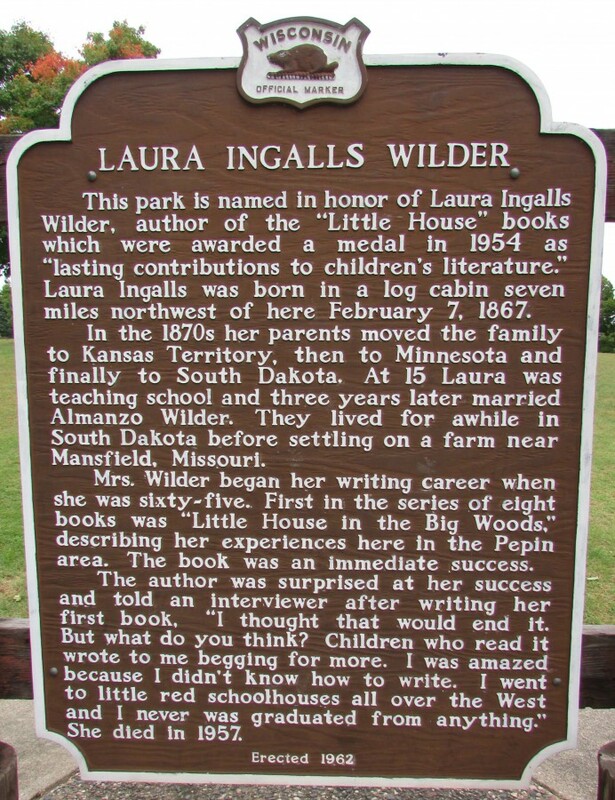 A little further down the road from here is the historic depot and marker dedicated to Laura. 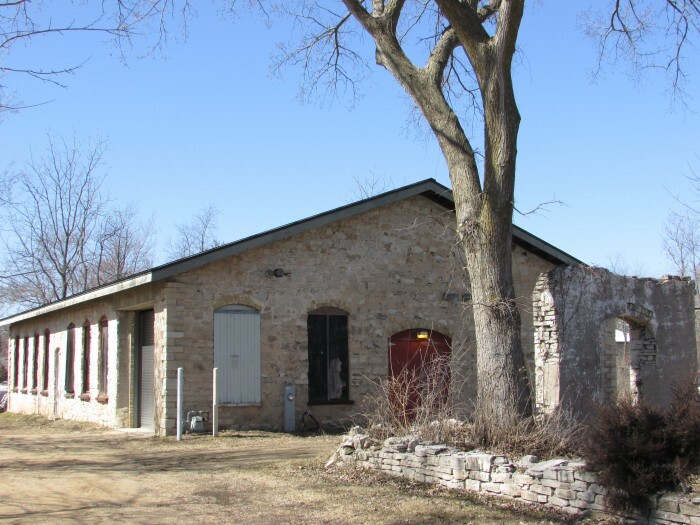 It was an actual depot in Pepin, now its a museum. It wasn’t open when we stopped by though. Here there was also a marker and anchor honoring steamboat captain Phil Scheckel. 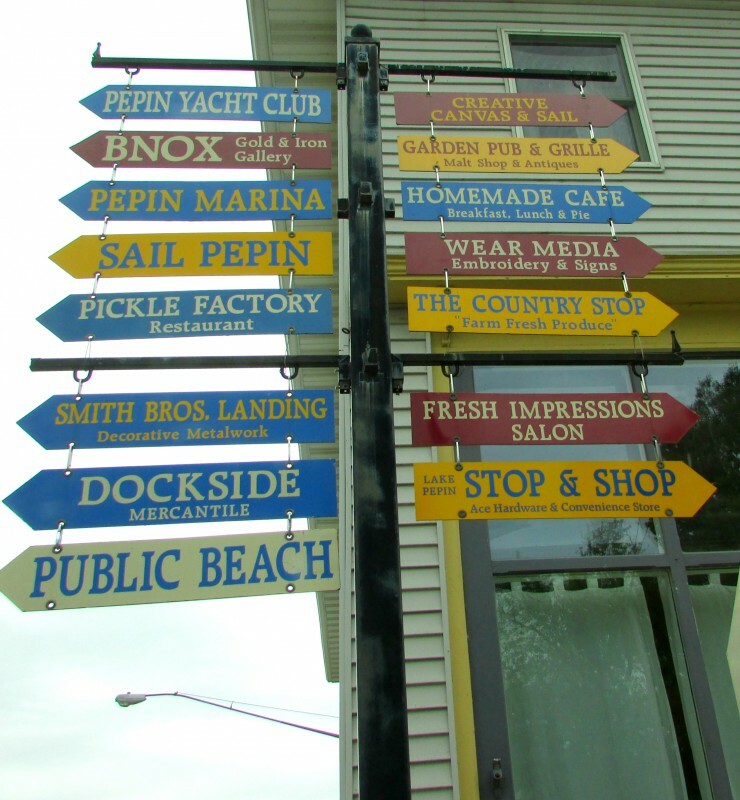 We also took a look at some of the businesses near the Pepin Marina not far from the museum. 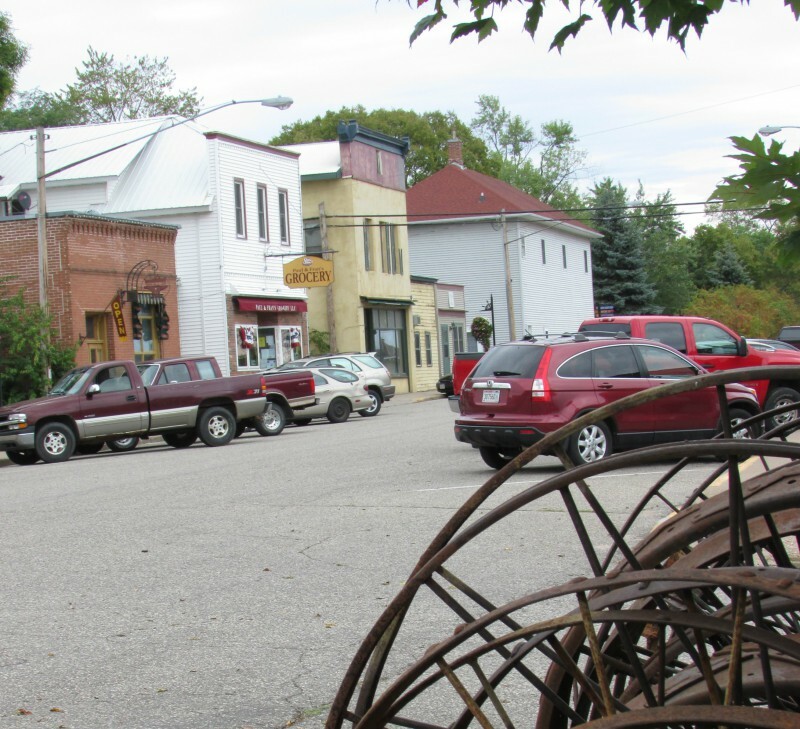 A row of wheel rims made for a nice frame of their downtown. Also this sign. 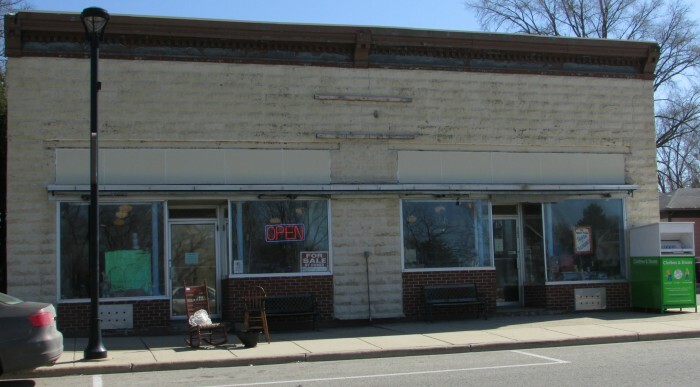 Paul and Fran’s Grocery, LLC reminded me of an old-time general store. 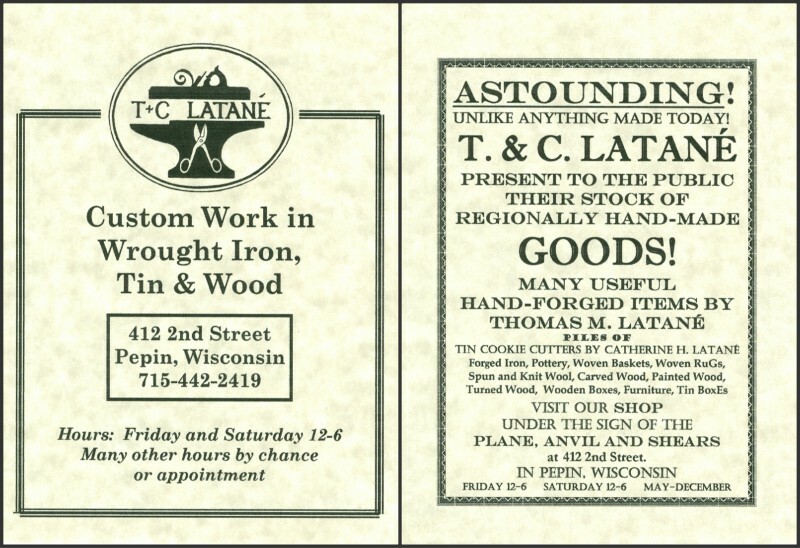 The one we really enjoyed visiting was the shop next to it, T. & C. Latané. 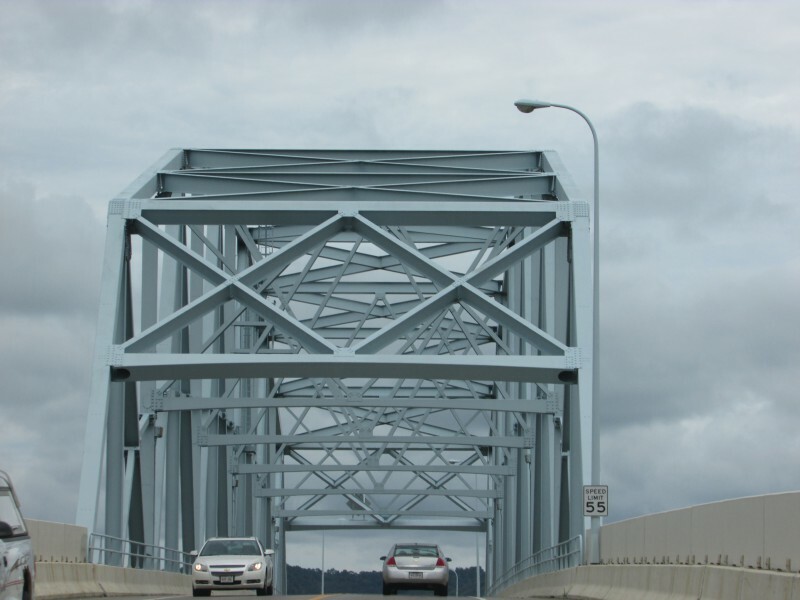 They specialize in custom-work in wrought iron, tin and wood. You don’t see many places like that anymore. Learn more from another visitor here. The ambiance was just as warm inside, including the owners Tom and Catherine. It turns out she also narrated the slide show we saw at the Laura museum too! Stop in if you would like quality work done by people, not a machine. 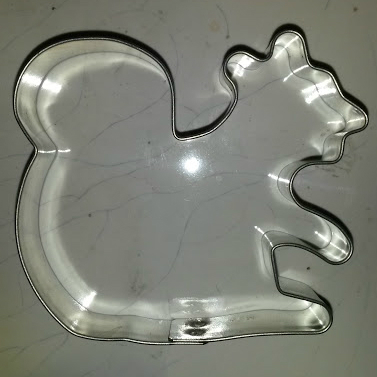 I got a squirrel cookie cutter, you don’t find those everywhere! 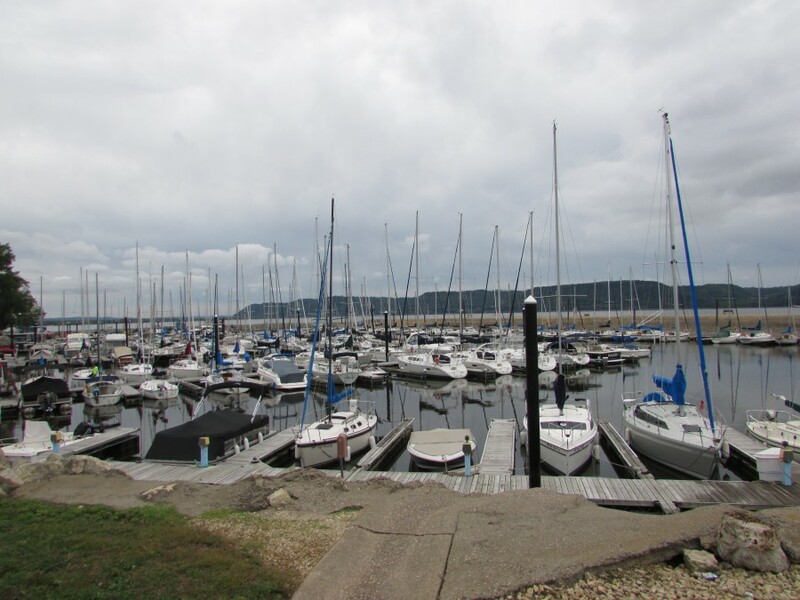 We had to take a look at the Marina too. Train tracks cross the marina entrance, there was a lot of train activity today. You could look across the river and see the cars on the Minnesota side. You could see darker clouds approaching and knew the rain was about to return. 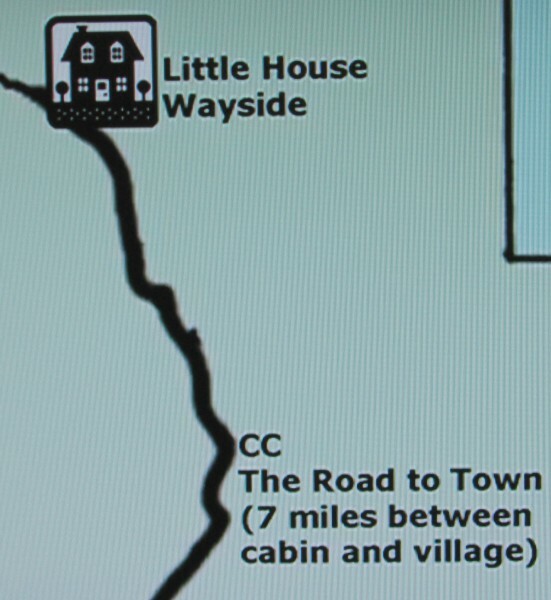 We made our way north to the final Pepin point of interest, the wayside making the cabin location where Laura was born. There is a marker there also. The rain had also started by the time we arrived. You could go inside too. 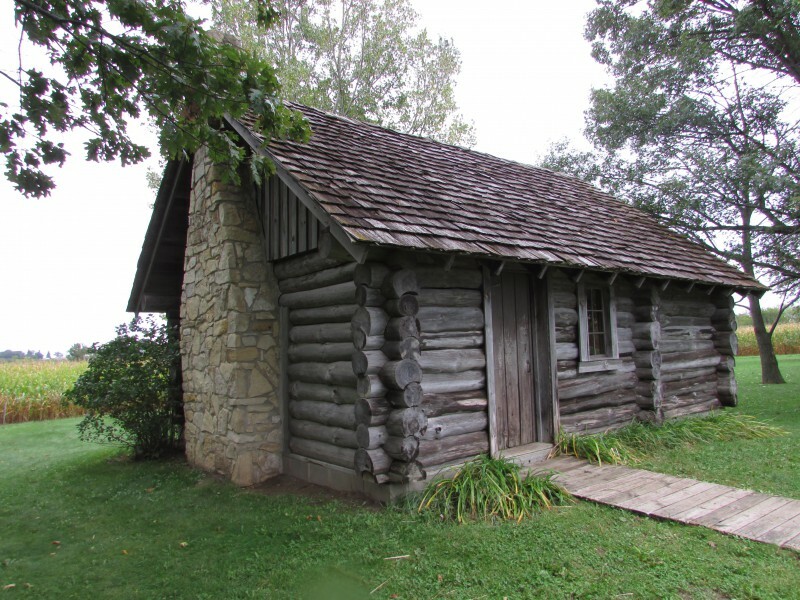 We take our leave of the Little House at the wayside steeped in the history of this community that played a part in the experiences of our favorite pioneer lady, Laura Ingalls Wilder! 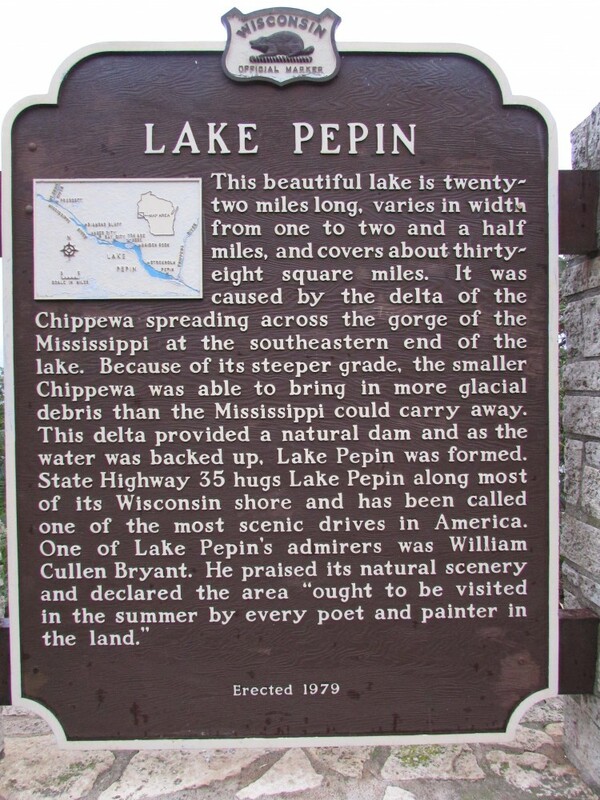 After we got back on the Great River Road, we saw a Lake Pepin marker. 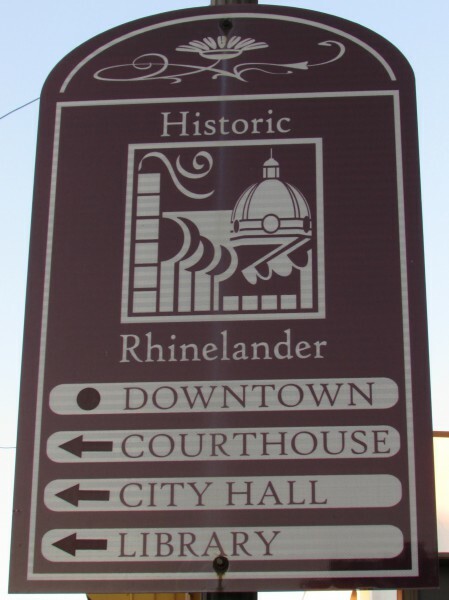 Rhinelander is a city of almost 8,000 in Oneida Co. It’s also the county seat. 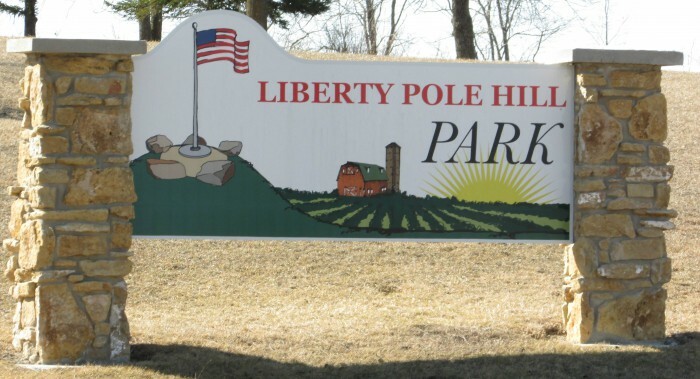 We have been wanting to come here for a long time, this gateway to the Northwoods of Wisconsin. We also wanted to see the mythical creature, the Hodag. 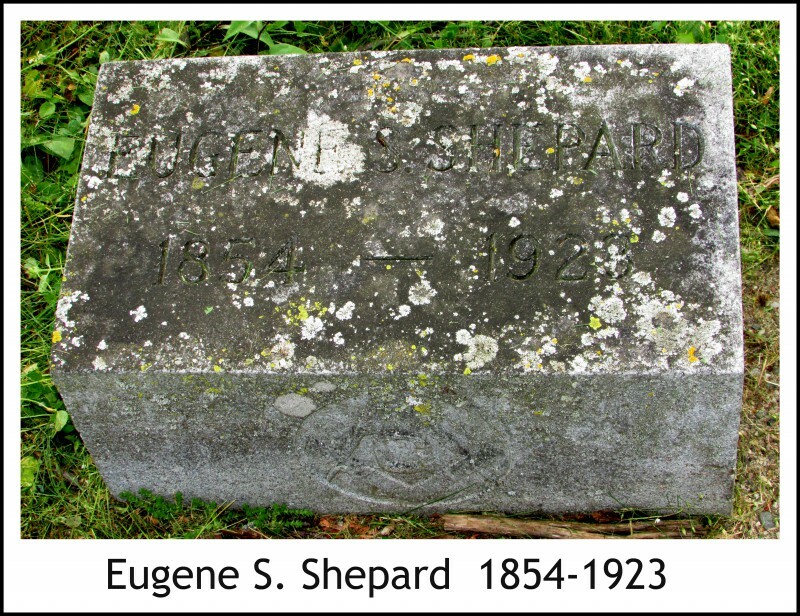 It was “discovered” by Eugene Shepard in autumn of 1893. This is the famous picture that he used to prove it was real. 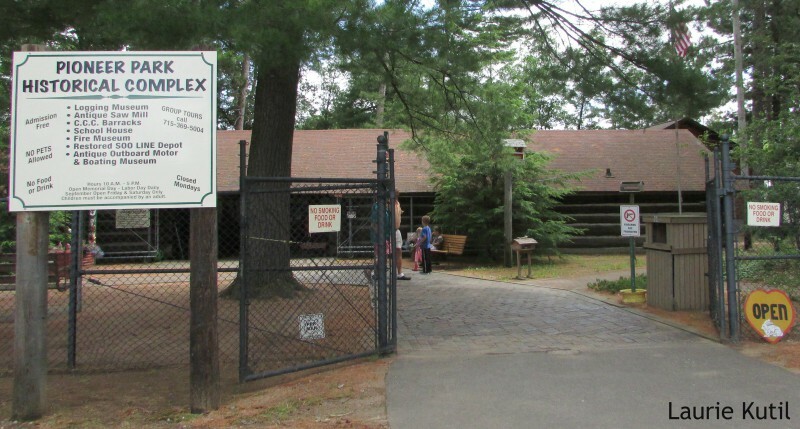 He showed the hodag at the first Oneida County fair in a dimly lit tent. People were skeptical about this creature, but believed it just enough to run out of the tent screaming when Eugene made it move, marionette-style. 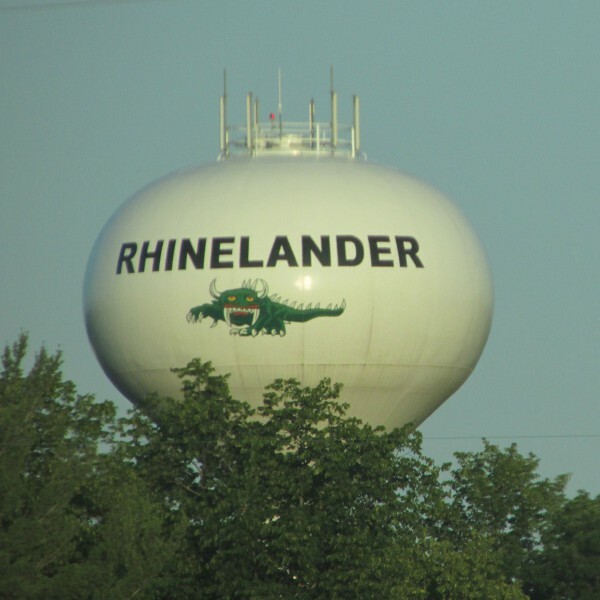 The hodag is still part of Rhinelander mythos today, now turned from a scary monster to a cute mascot for the community. 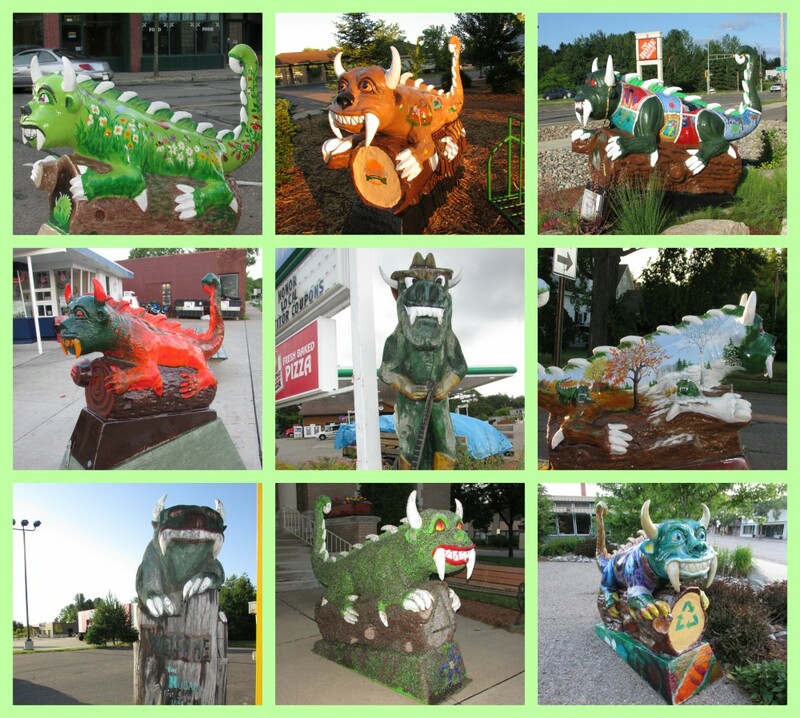 The first place one should stop is the Chamber of Commerce, where you can take your picture with the Hodag and pick up area information. It is at 450 Kemp St. We did just that! Don’t worry, this one is tame and LOVES posing for pictures 🙂 There are many more scattered throughout town, we saw as many as we could. This is a sample, we counted about 20 but probably missed some. 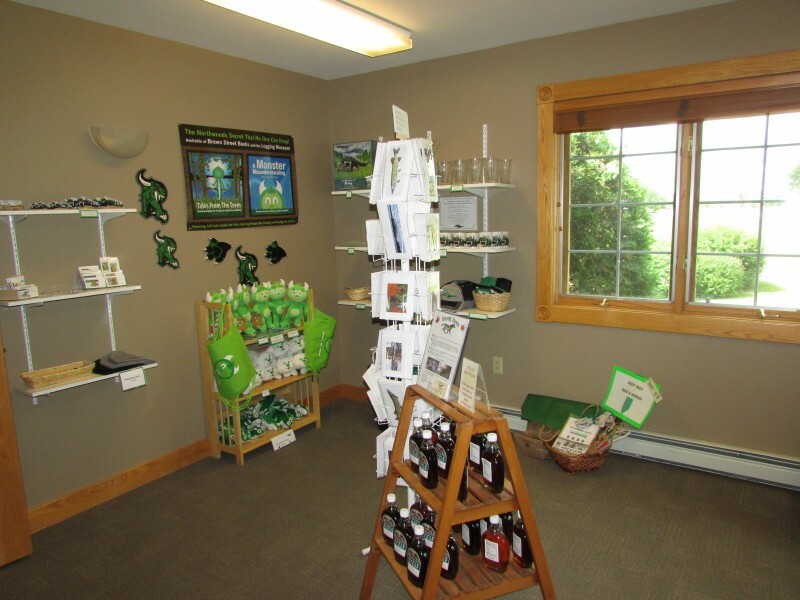 You can get Hodag souvenirs here too. 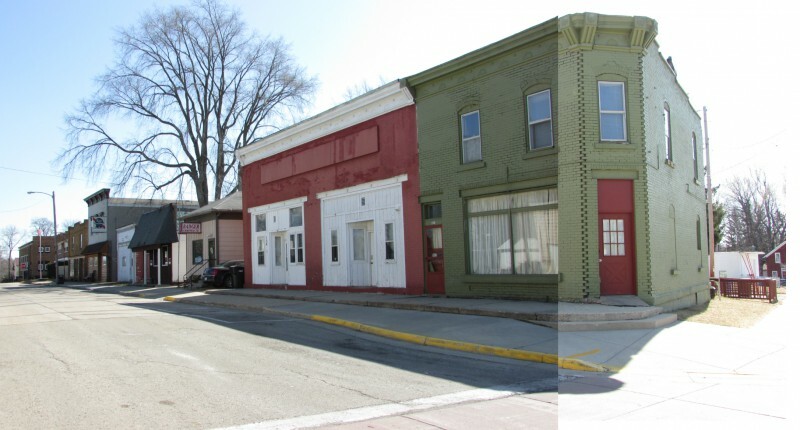 Hodags downtown, such works of art! This video is a good summary of Hodag lore. 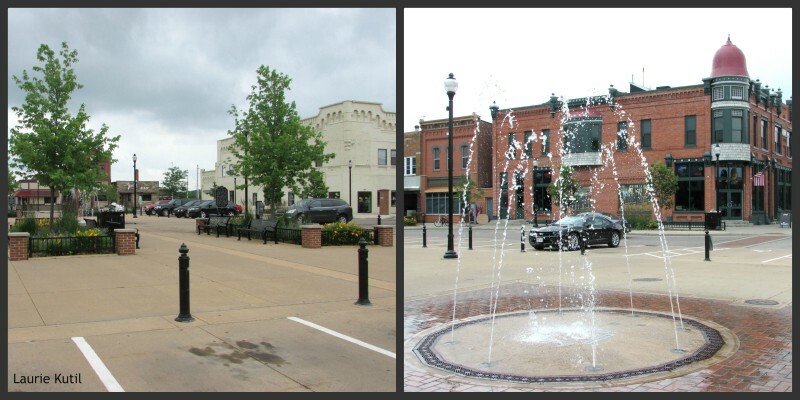 Lets take a look at the historic downtown, it was filled with many beautiful buildings. District Library-1898 This is an Andrew Carnegie library. 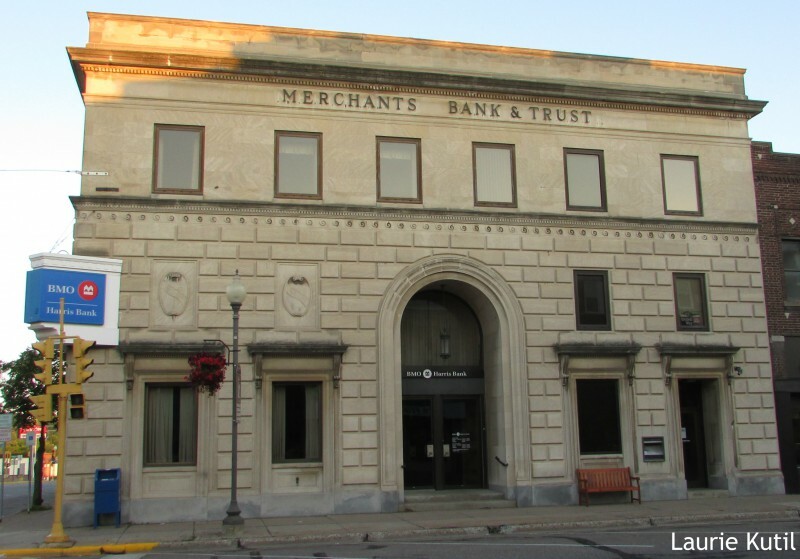 The Merchants and Trust Building, the library was in a room there before the current building was built. 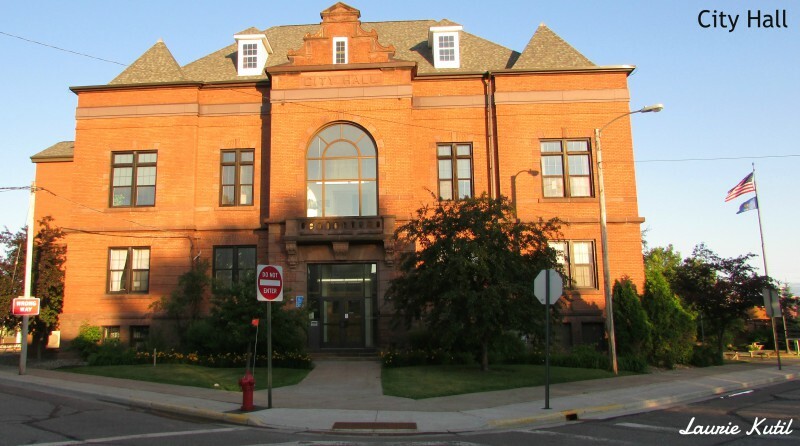 My favorite building is the Courthouse, beautiful day or night! This is the view shortly after sunrise, then 2 AM on July 8. The night is short there this time of year. The dome is Tiffany glass, VERY unusual. It glows green at night. Closeup of the glass panels within each square that makes up the dome. And at night, my favorite! 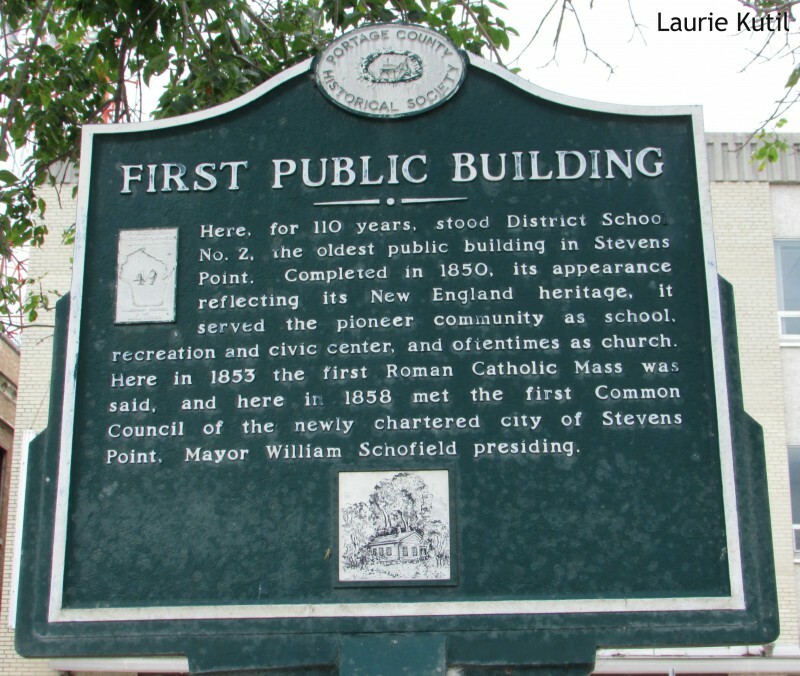 There are also historical markers on site. This sounds strange, but we often make a cemetery one of our stops. We stopped at Forest Home Cemetery to see the sites of two notable people buried here. This cemetery is large and it was a challenge finding them. 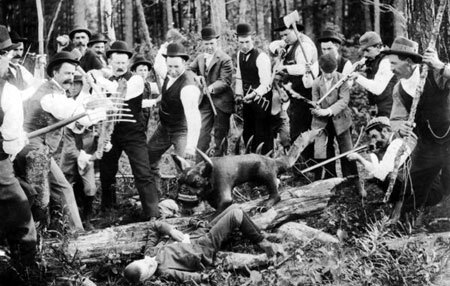 The hardest one was Eugene Shepard, the man who “found” the first Hodag in fall of 1893. 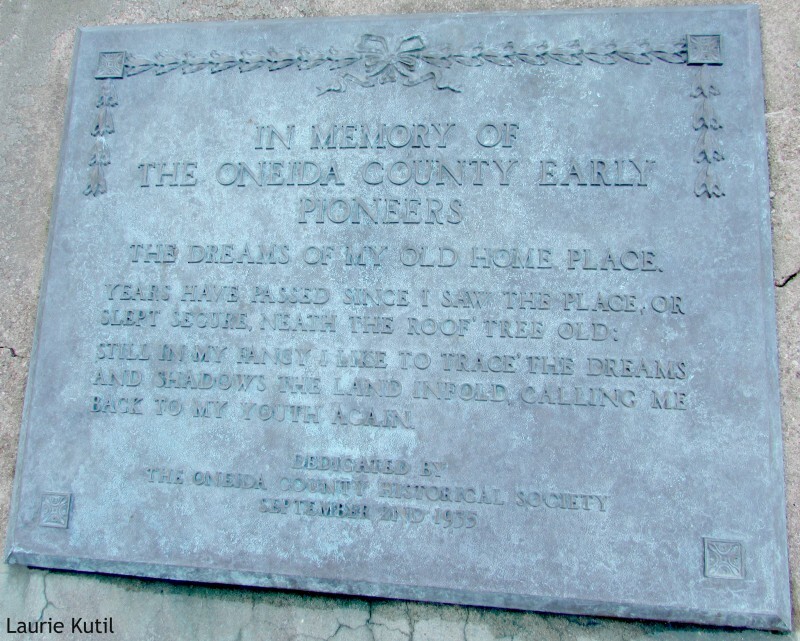 For someone who is largely responsible for Rhinelander’s identity, his gravesite is very humble. Here it is, plus it’s coordinates. 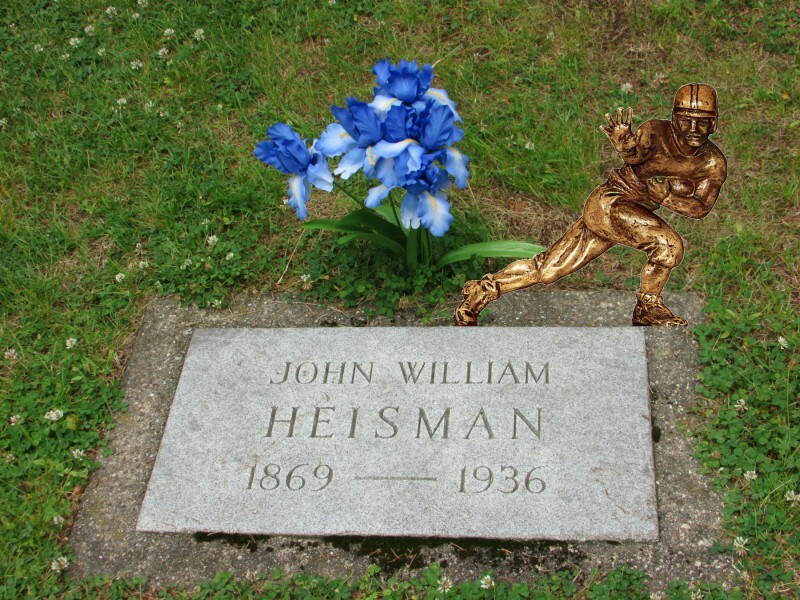 The other gravesite is John W. Heisman, founder of the Heisman Trophy. His is even more humble, it’s a flat marker. This is how we found it. 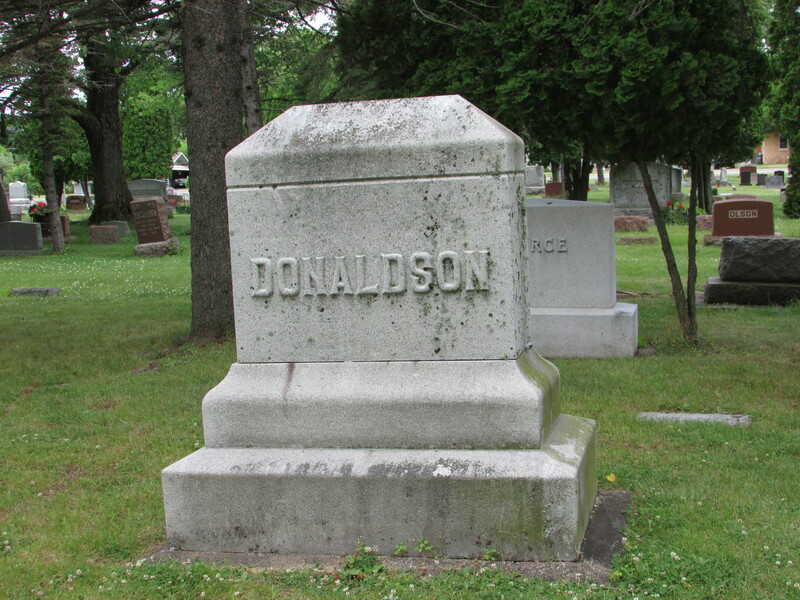 Look for the Donaldson large monument, it is in front of that. 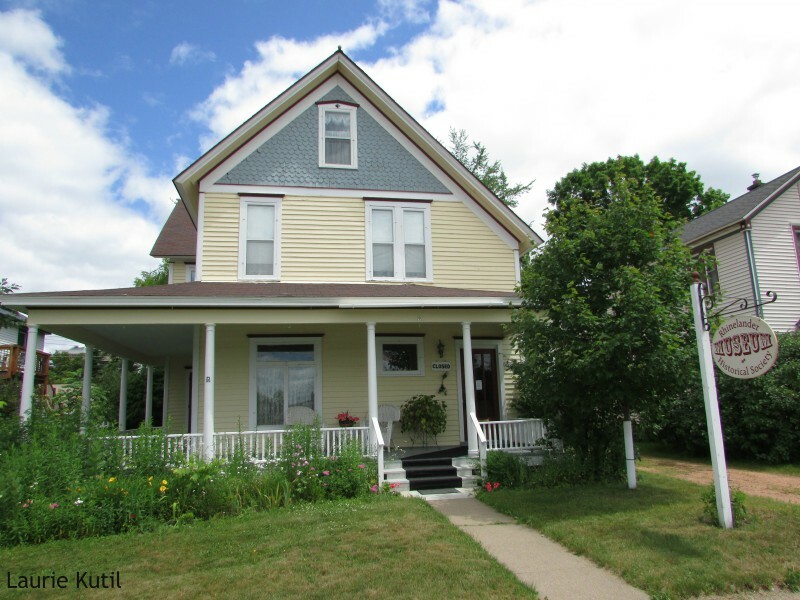 We also saw a Packer house on 224 Sutliff Ave.
Rhinelander also has two museums. 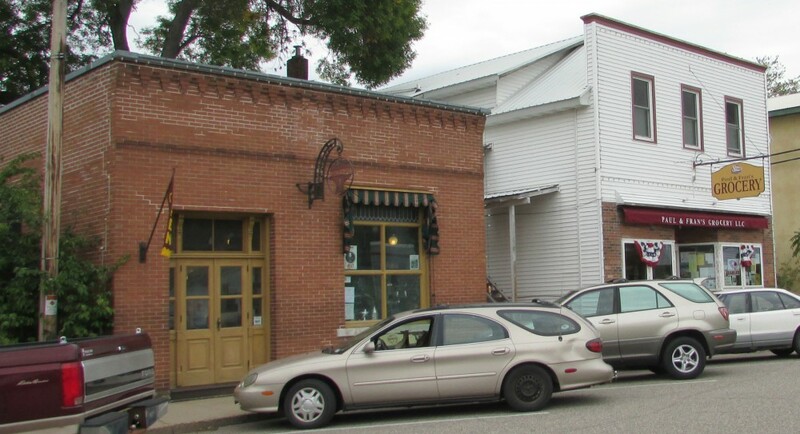 The Rhinelander Historical Society Museum on 9 South Pelham St. was not open, despite the sign saying it was open when we arrived at 2 PM on a Tuesday. 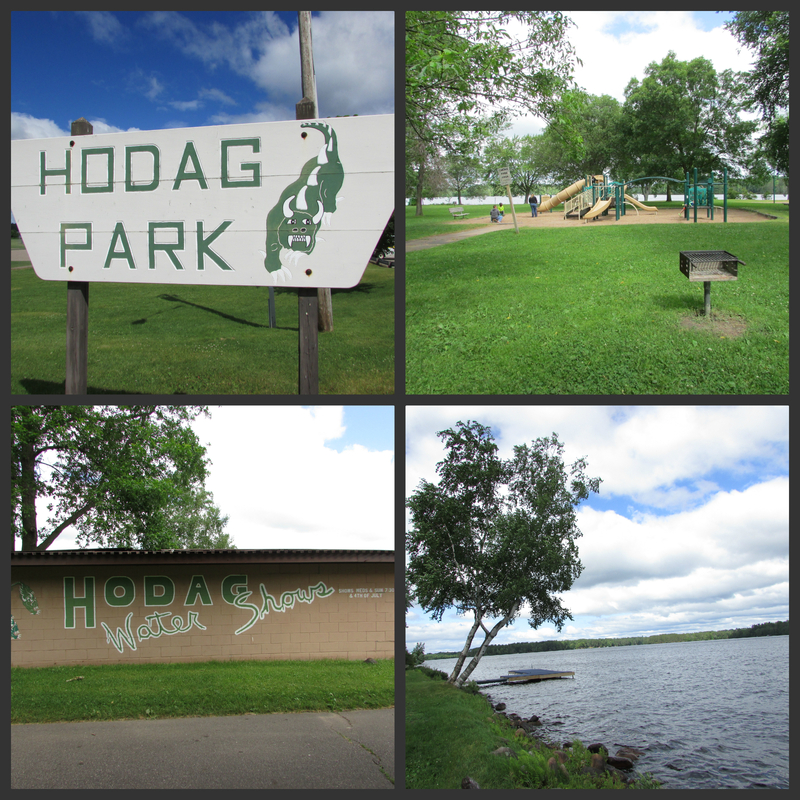 We also had a great visit at Hodag Park, on the shores of Boom Lake. 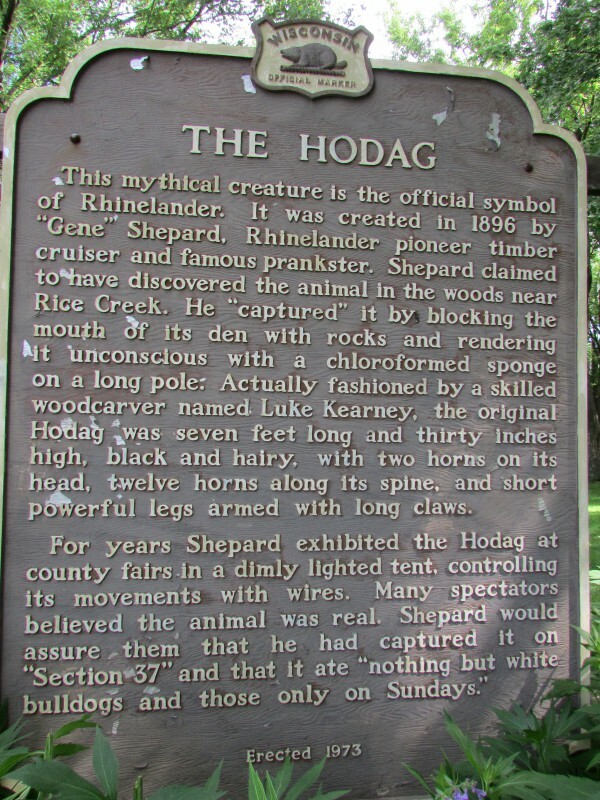 Here you will find the Hodag historical marker and several shelters and playground. There are also Hodag Water Shows in the summer. 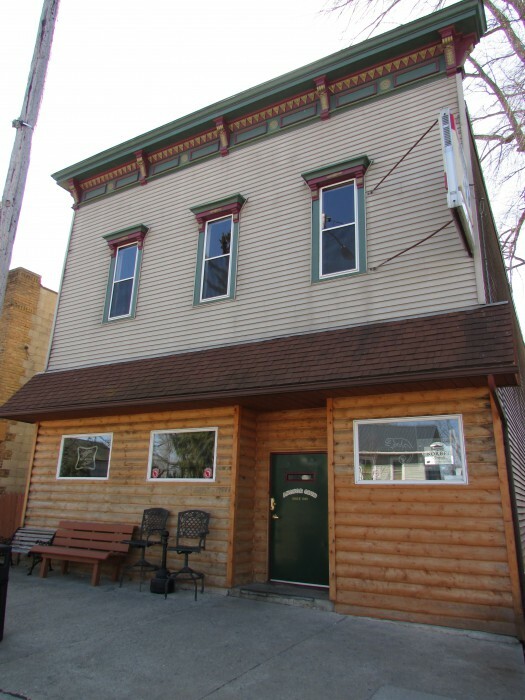 Rhinelander has many restaurants. We ate at two of them. 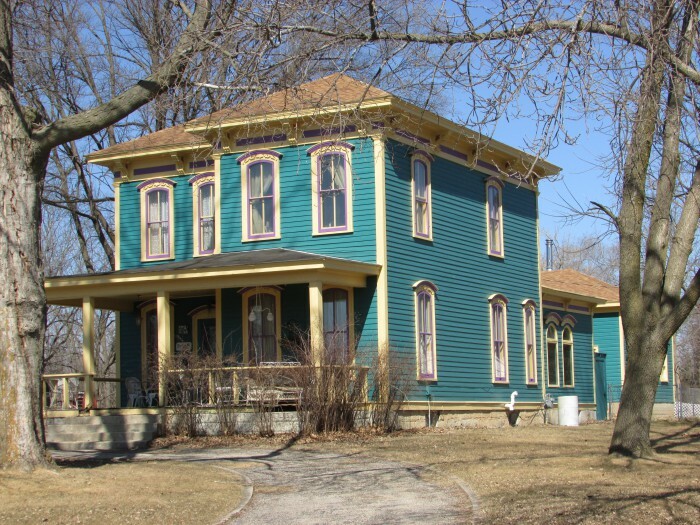 We had a dinner and breakfast at the Friendship House on 2260 Lincoln St . They open early which was great for our busy day of exploring. 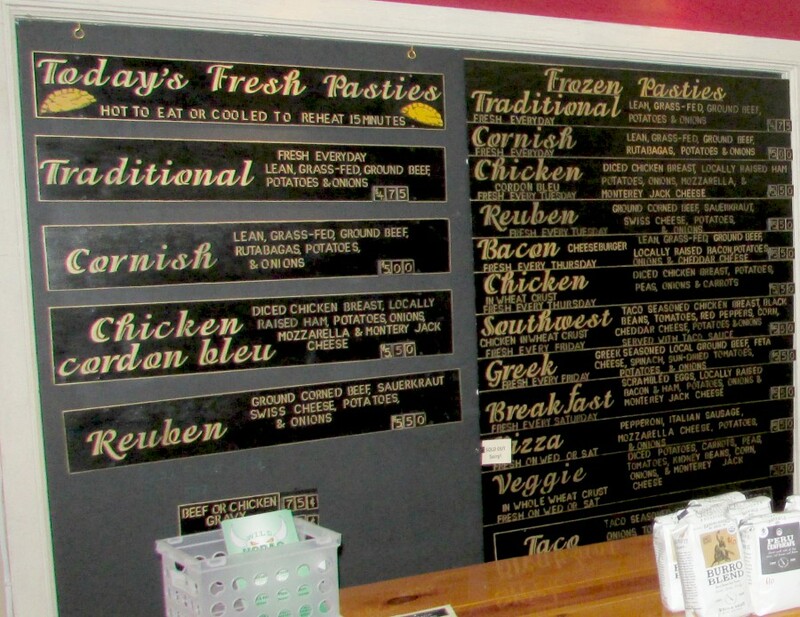 We were treated like regulars, the staff takes great pride in their work. Our coffee cup never had the chance to get empty. Chris told us proudly he made the pies, you know we had to have a piece! 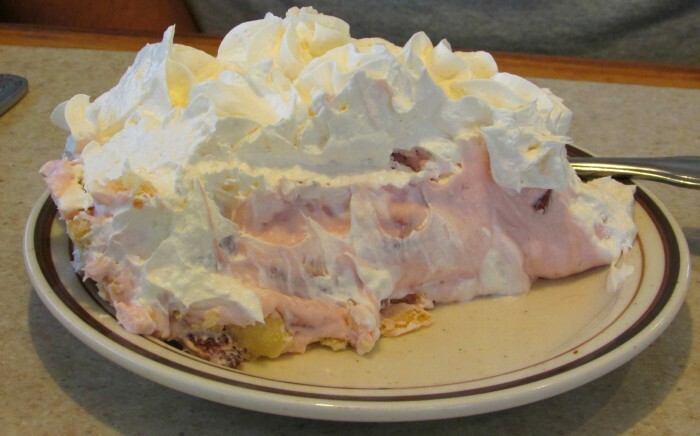 Al and I shared a piece of Strawberry Cream. Selection changes daily. 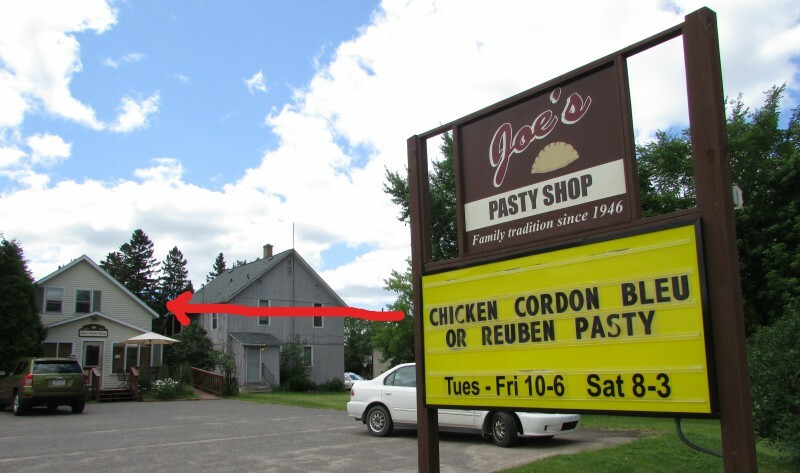 The other place is where “Around the Corner With John McGivern” visited, Joe’s Pasty Shop. We wanted a simple meal after spending Tuesday exploring all over town. The have four flavors ready-to-eat and many more you can bring home frozen ones to cook later. Delicious! View John’s entire visit to Rhinelander last summer. We stayed two nights at the Days Inn downtown, only a block from the courthouse which made my night photo of it a short walk away. The only drawback is there is not a free continental breakfast. It was a good excuse to go back to the Friendship House after a fine dinner there the night before. 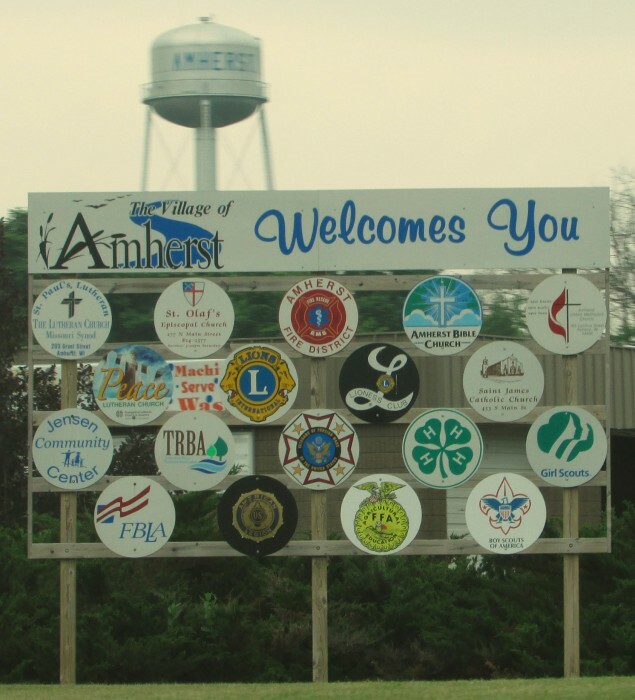 We didn’t get the chance to go to this, but the Hodag Country Festival held every July is probably their biggest event of the year. In 2015 it was July 9-12. The local radio station Hodag Country 97.3 FM WHDG is your official source of information and even a webcam of the festival. They stream so you can listen anywhere, download their app too for your mobile device. 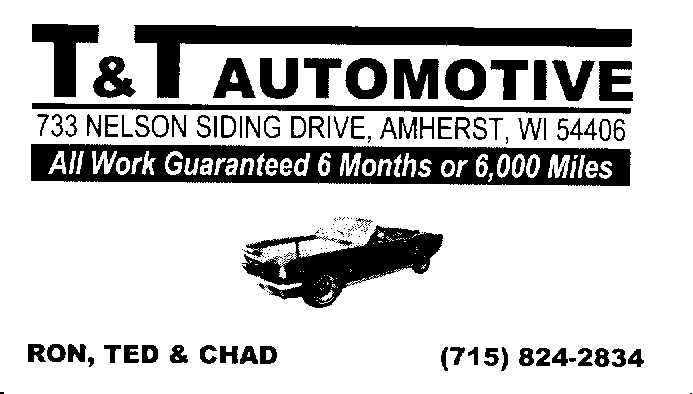 Their sister station is Hodag Legends 101.3 FM or 1240 AM WOBT. 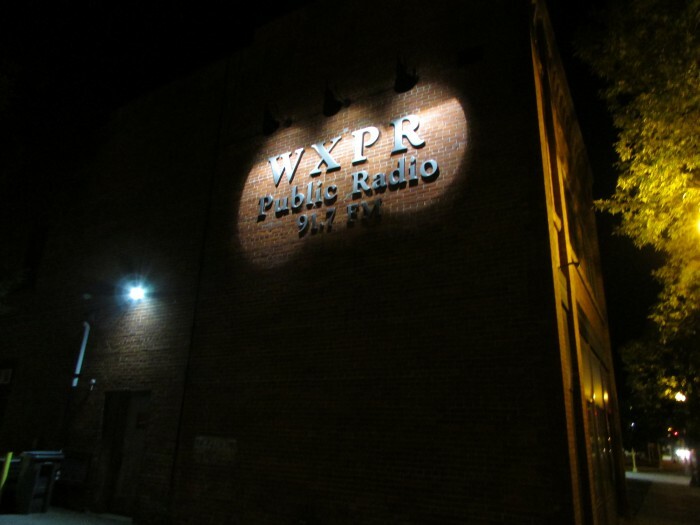 Rhinelander’s Public Radio station is WXPR 91.7 FM. 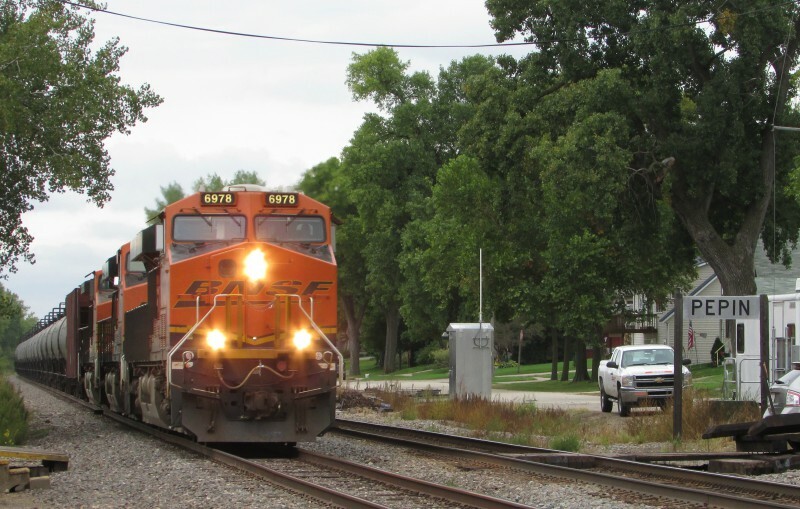 On our way out-of-town as we headed to Lac du Flambeau on July 8, we saw a caboose on the outskirts of town outside of Evergreen Acres. On our right as we headed north. 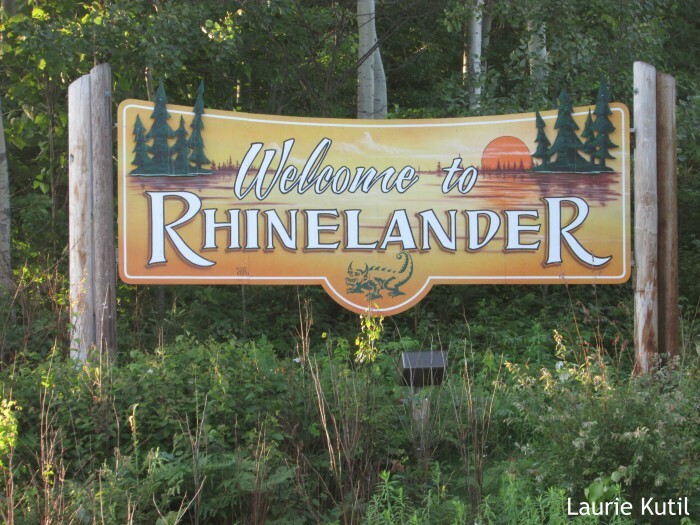 Thanks for the great time Rhinelander, we enjoyed our visit! 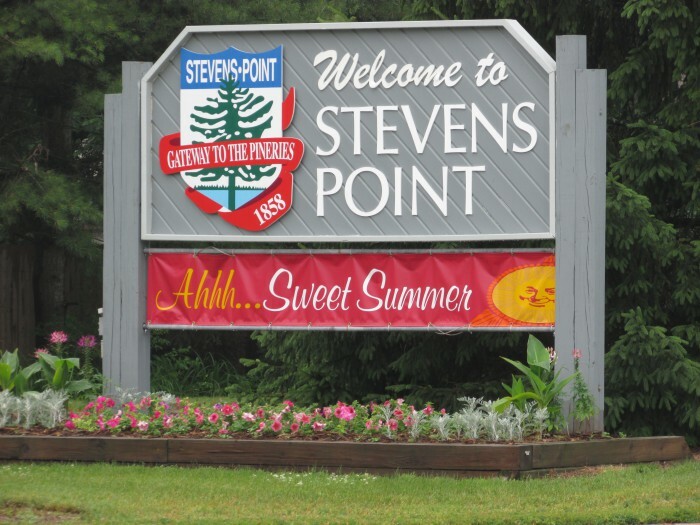 An introduction to the Stevens Point area. 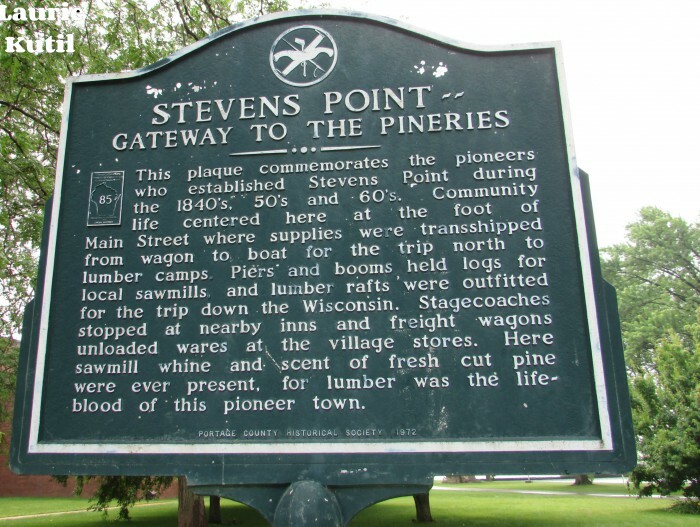 Stevens Point is the Portage County Seat, with a population of 26, 717 with a rich history in the logging industry in the 19th century. 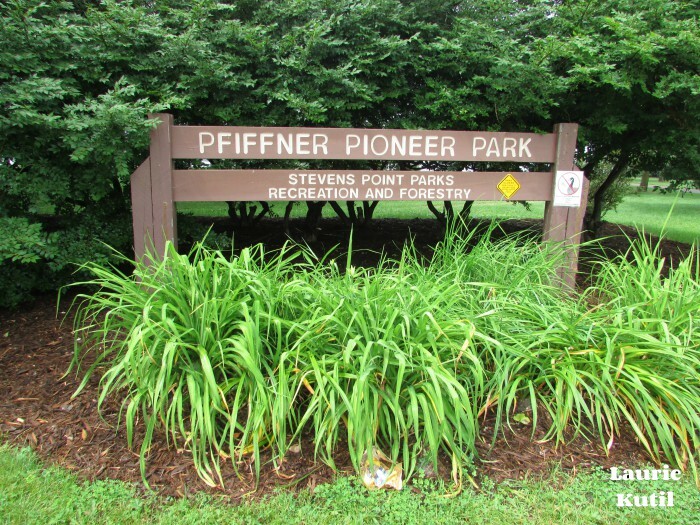 We stopped at Pfiffner Pioneer Park and found out why it’s called the “Gateway to the Pineries”. 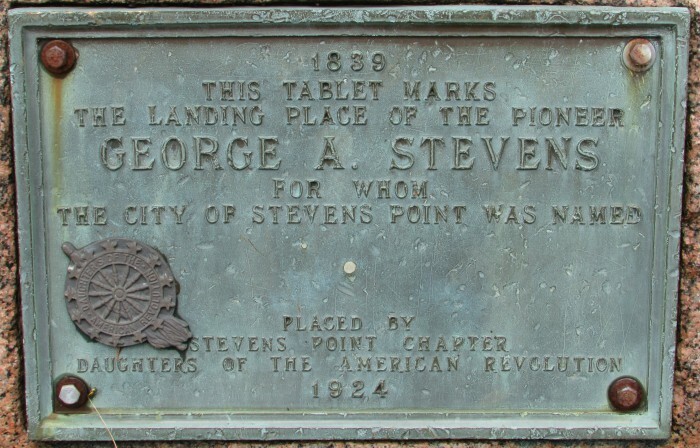 there is a marker there about that, as well as a marker dedicated to George Stevens, whom the city was named after. 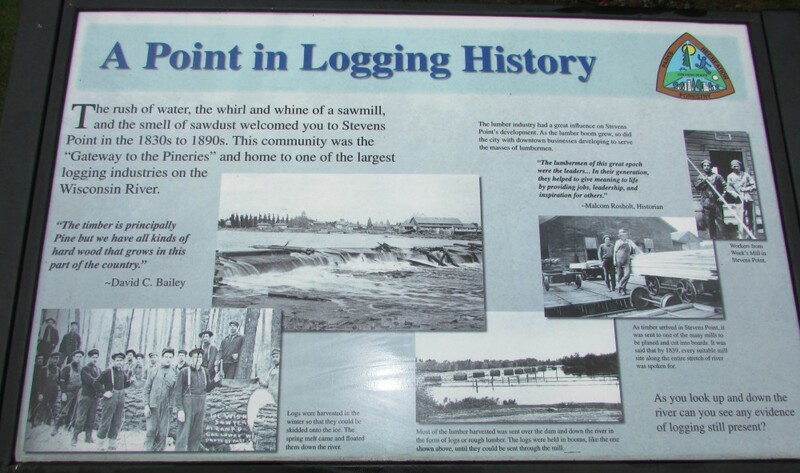 There are other signs at this park describing the interesting history of Stevens Point. They even made pearls buttons! The Riverfront Arts Center is in this park also. You can see the Pineries and Stevens marker in this view. The view across the Wisconsin River shows the water tower and New Page Paper Mill company. 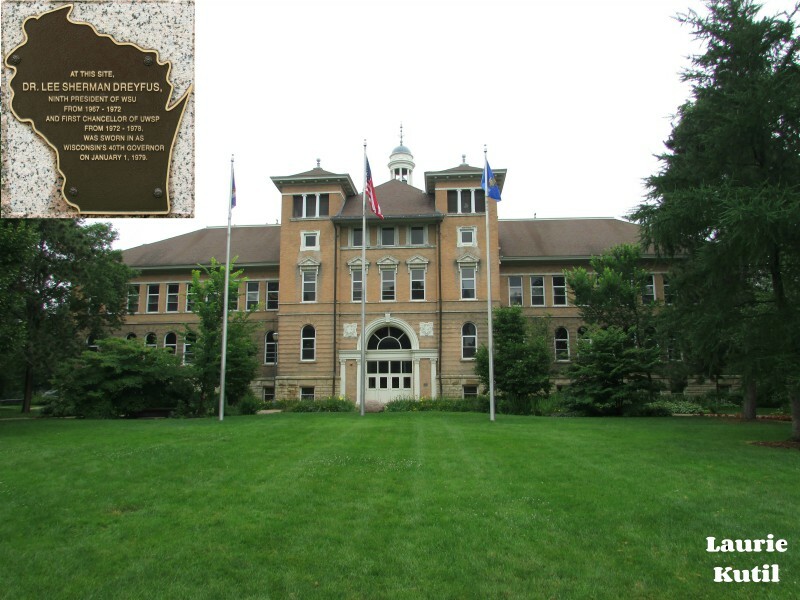 My husband lived here for one year while he went to college at the University of Wisconsin in 1980. Former Gov. 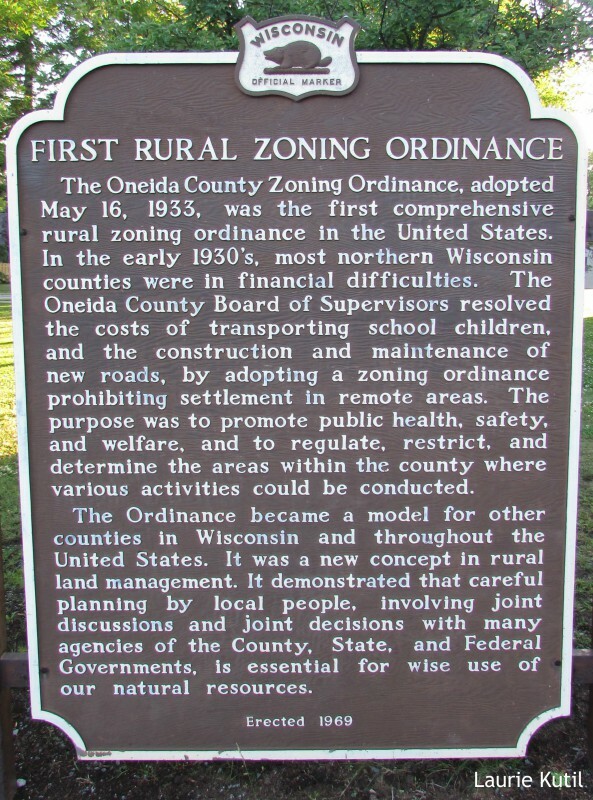 Lee Dreyfus was inaugurated here on 1-1-79. He relates his experiences here when we last visited in 2001. It’s on that rock in front of the building. 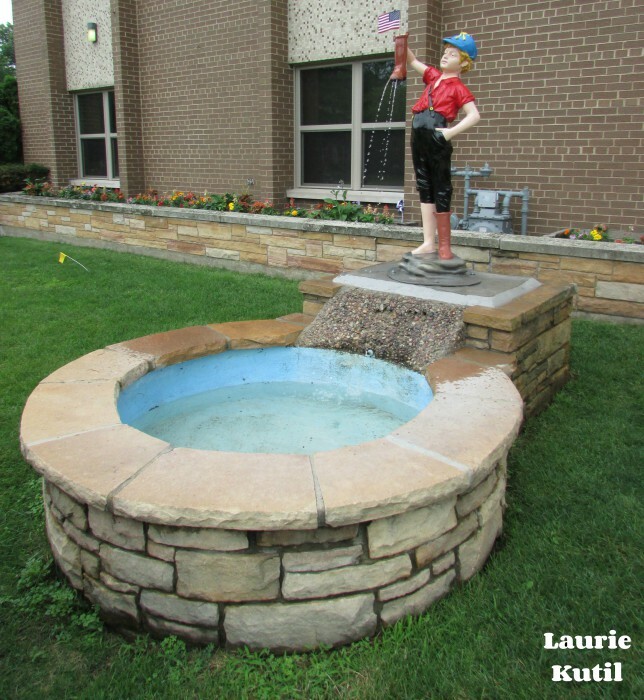 Stevens Point is also home to a rather rare and unusual water feature, The Boy With a Leaking Boot. Here it is in operation. 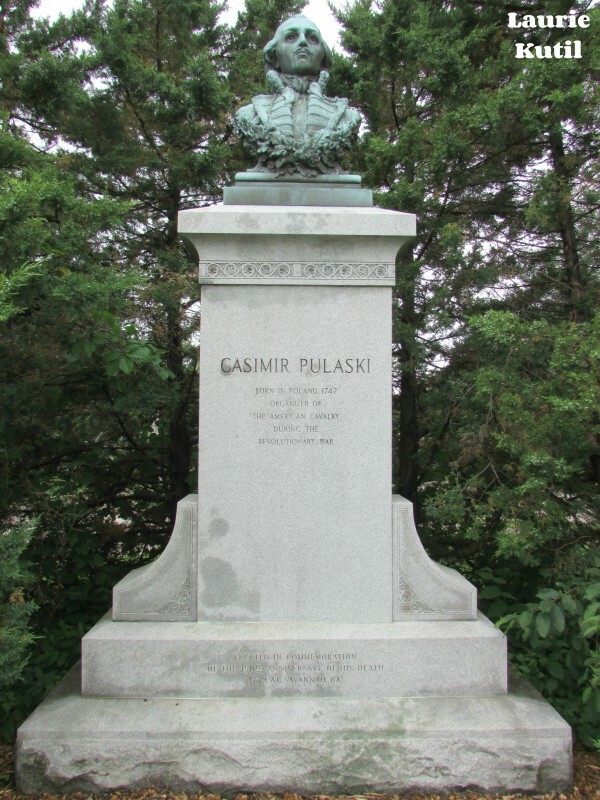 Many of the early settlers in Stevens Point were Polish, and to honor that heritage, they have a statue of Casmir Pulaski. 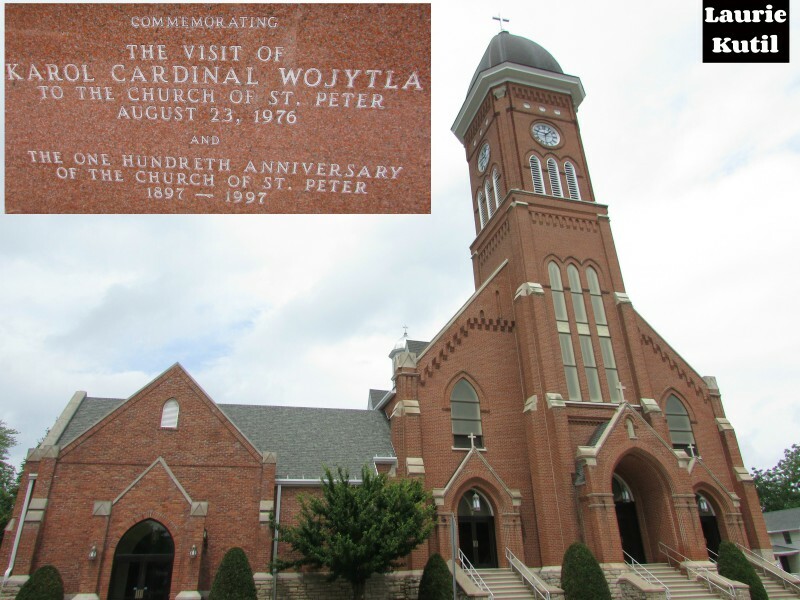 At St. Peter Catholic Church, Cardinal Karol Wojtyla from Poland came to this church during its Centennial. Two years after this visit he was elected Pope John Paul II. 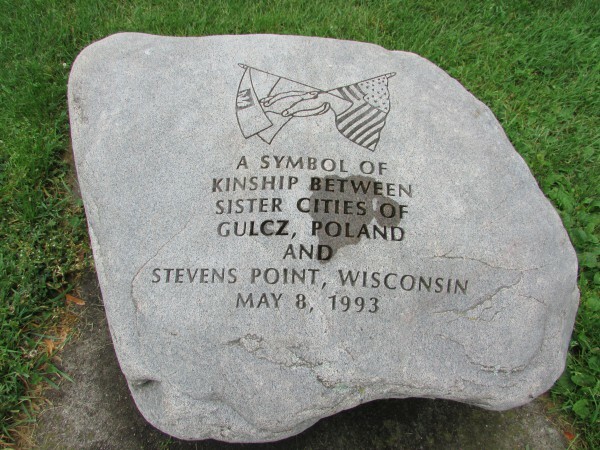 Stevens Point also has a sister city in Poland. 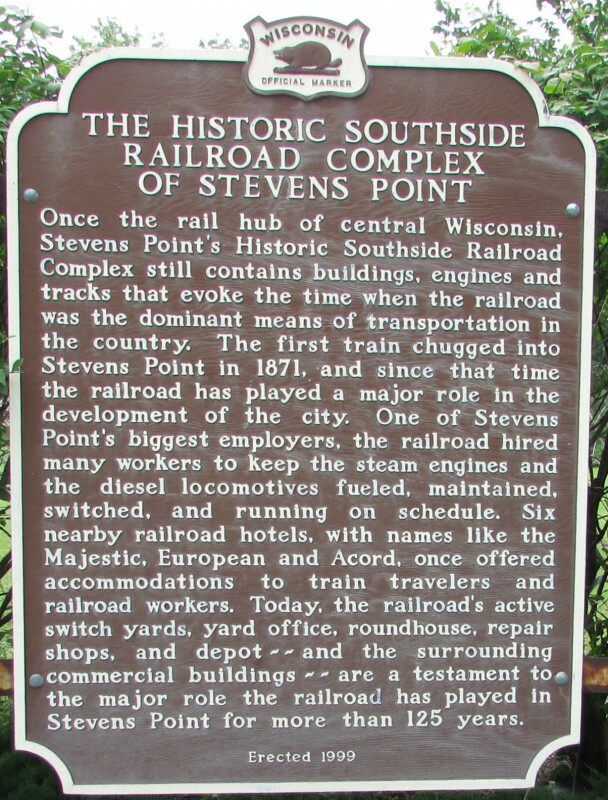 Stevens Point also pays homage to its railroad history, still very active. 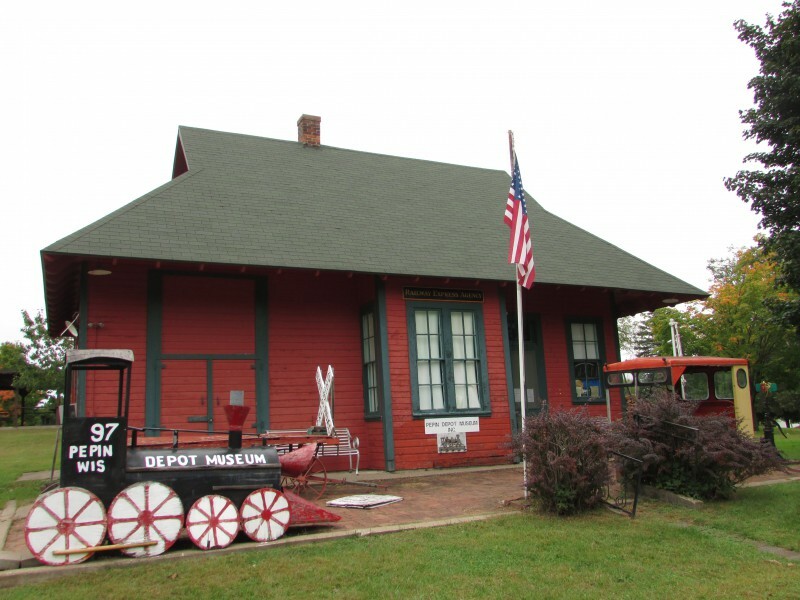 This is the depot with a train present. 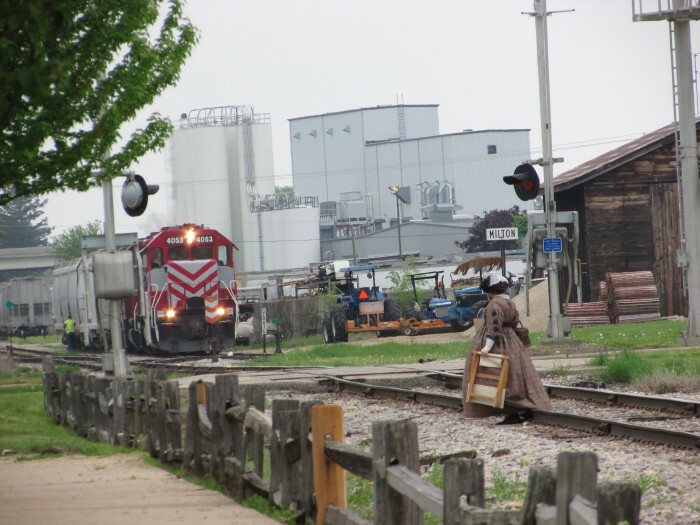 Across the street is the Southside Railroad Complex, complete with steam engine and Soo caboose. 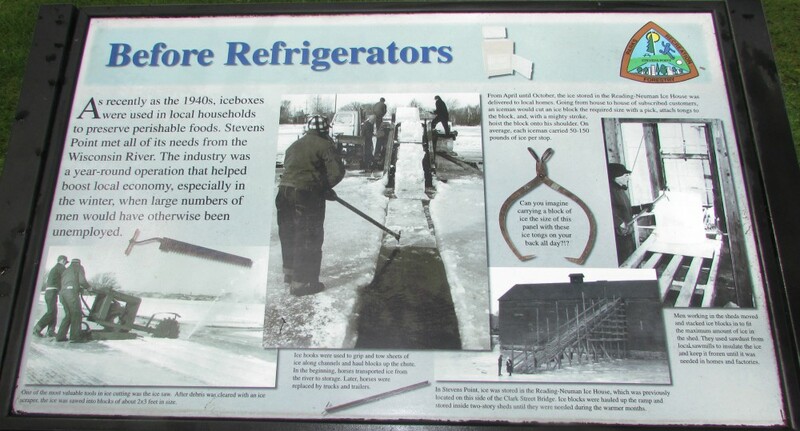 Funds are still being raised for continued renovations of the cars. Go to SOO2713.org to learn more. 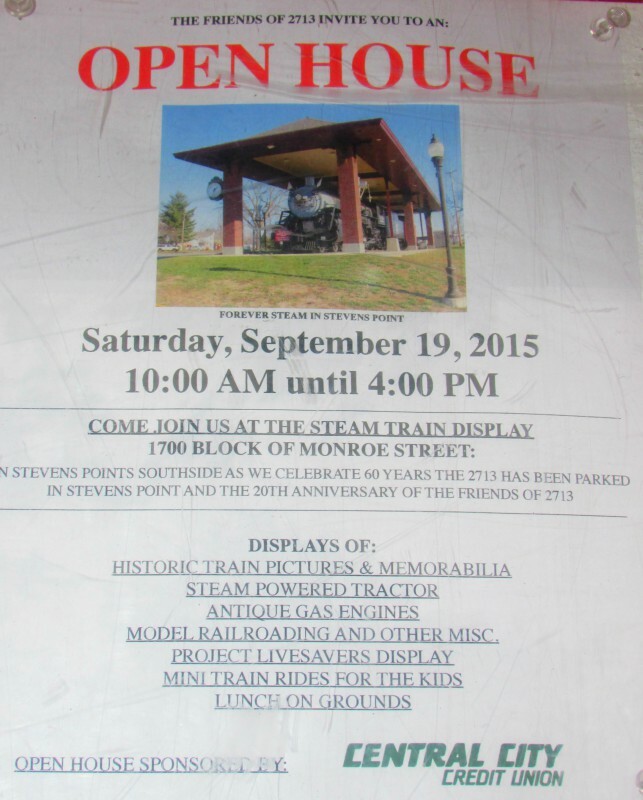 There will be an open house here on Sept. 19. For those wishing to arrive in Stevens Point, the Municipal Airport is there to serve your needs. 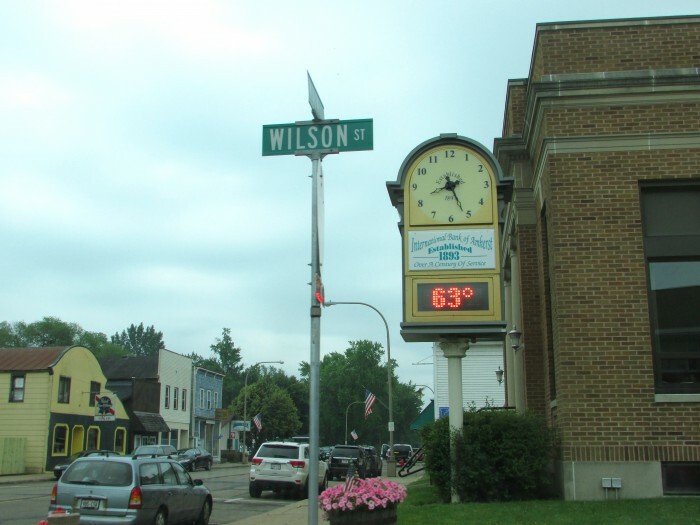 Downtown is beautiful, having preserved many historic buildings still in use with many businesses. 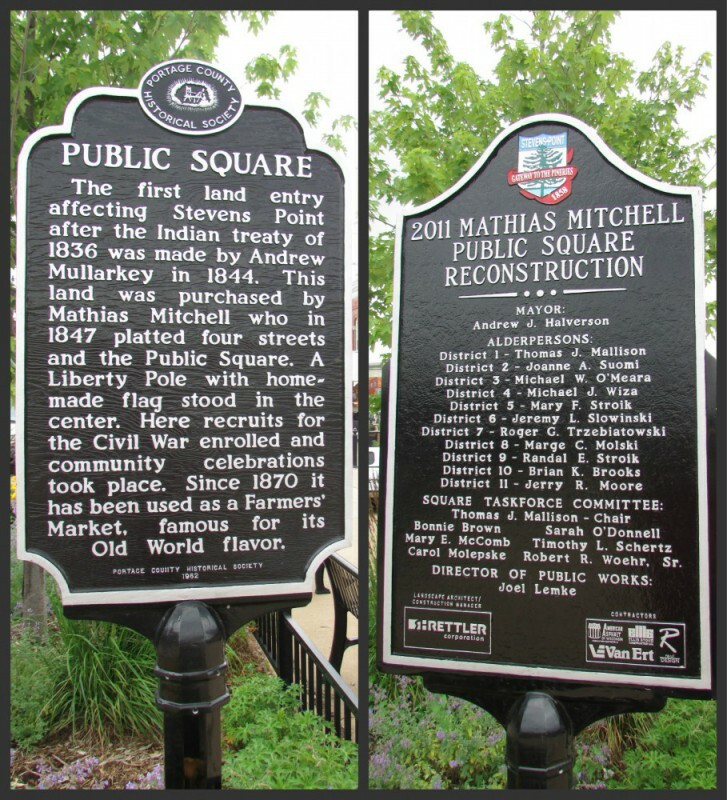 The Mathias Mitchell Public Square has been a gathering place for the community for over a century. 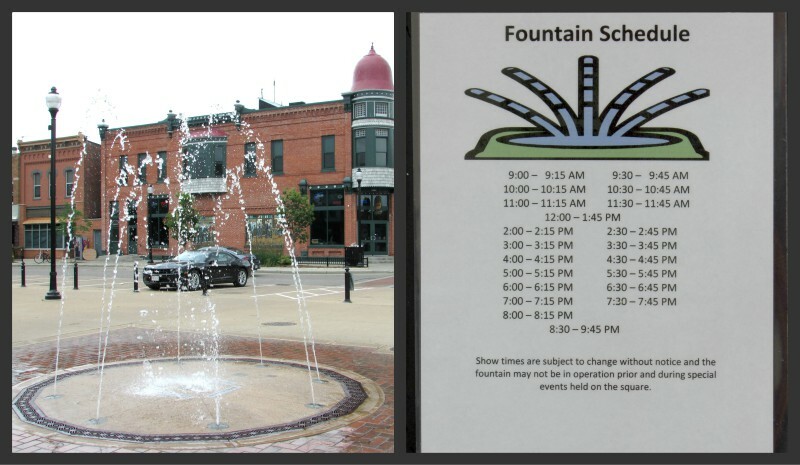 In the square is also a fountain, complete with a performance schedule. 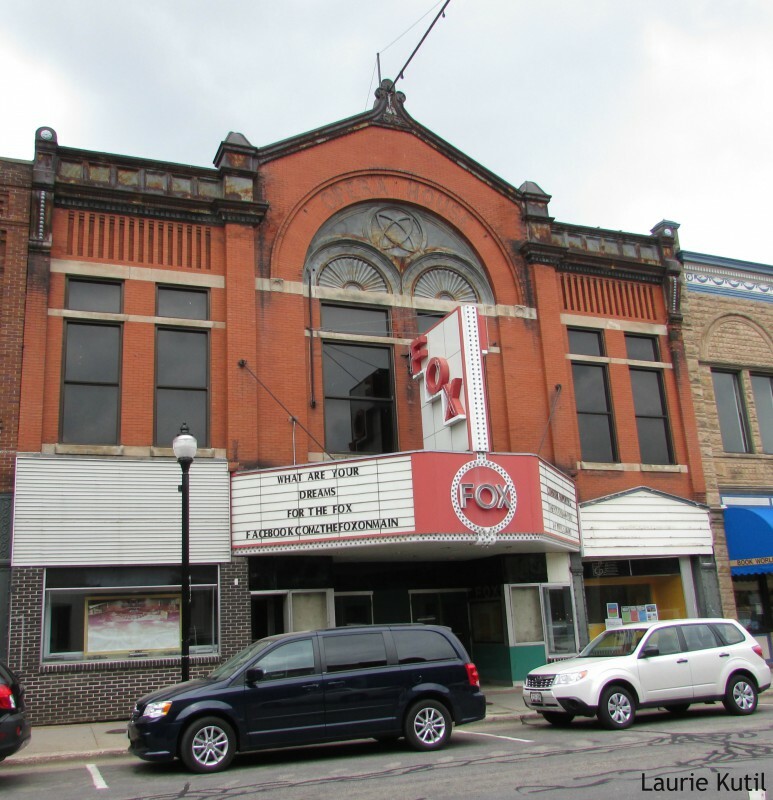 Other features downtown, the former Opera House, “The Fox on Main” is currently vacant. 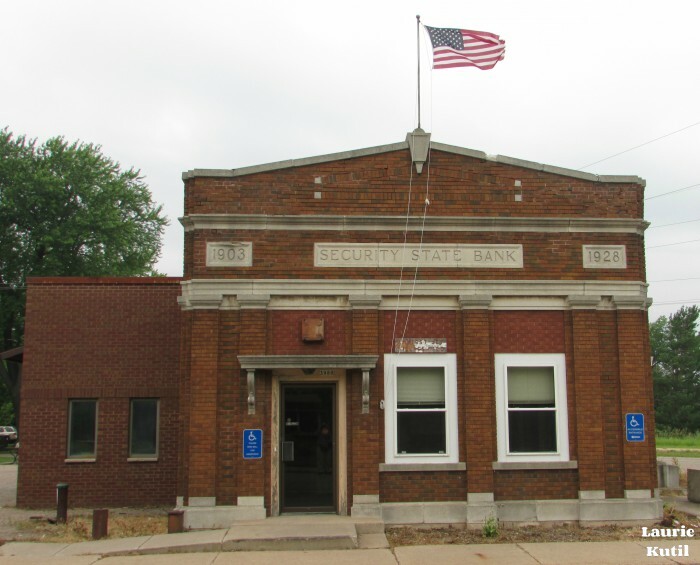 Donations are being collected to refurbish this historic building. 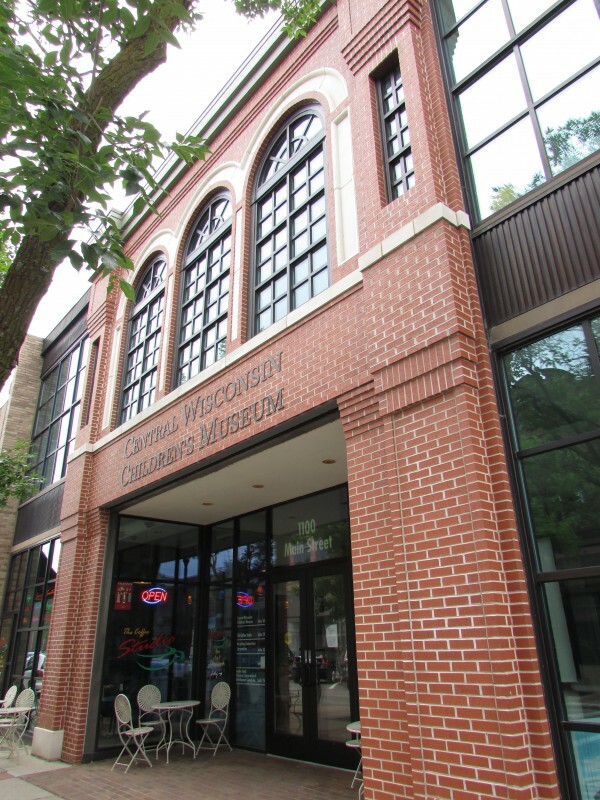 The Central Wisconsin Children’s Museum can also be found on Main. 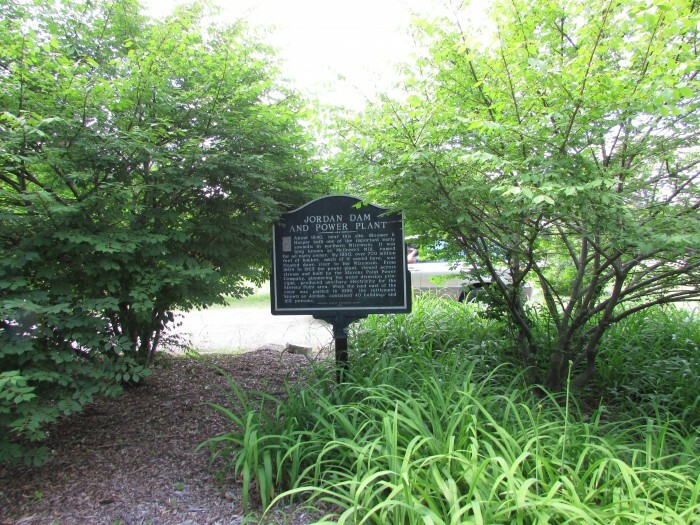 At the back of the Portage County Public Library parking lot is a marker, it was the site of the first public building in town. All this exploring can make you hungry, and we had lunch at two top places. 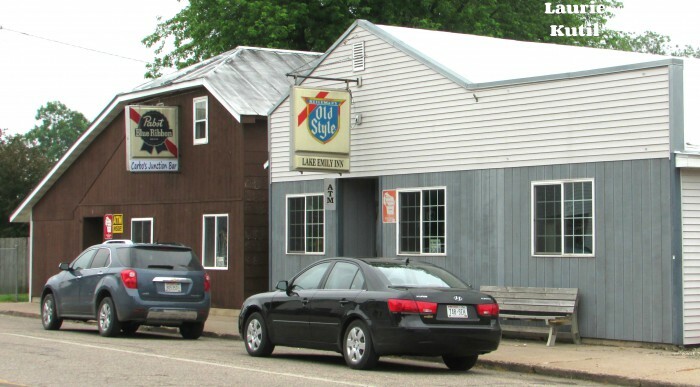 On July 6 we went to the Hilltop Pub and Grill on 4091 Main Street. What a beautiful building too! The food was also delicious, I had the beef brisket sandwich and Al had the Chicken Flippers from the appetizer menu. Yum! 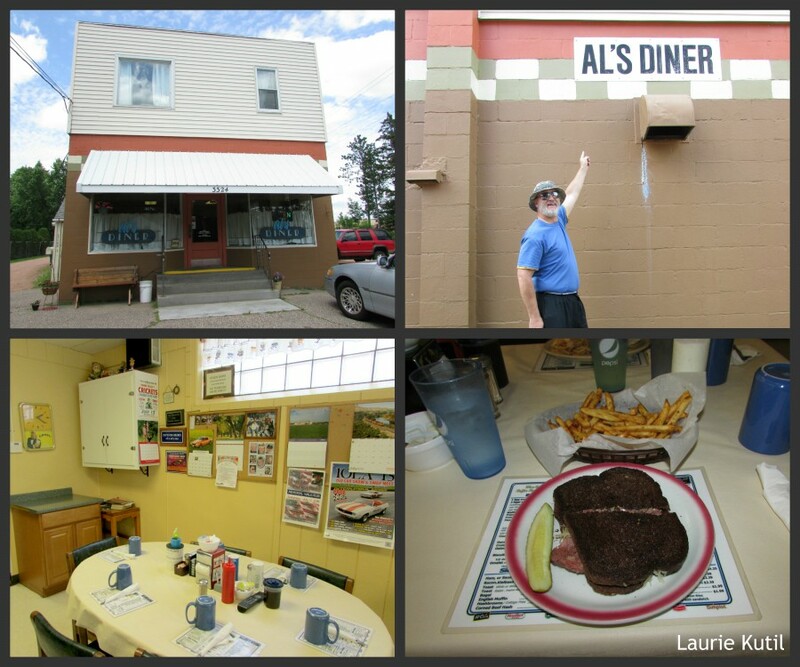 On July 8 we went to Al’s Diner, tucked away in a residential neighborhood on 3324 Jefferson St. We felt welcome from the moment we walked in, and left as friends with the owner Gail Guzman. Also one of the local ladies were there and we chatted with her as well. We will be back next year on our return visit! 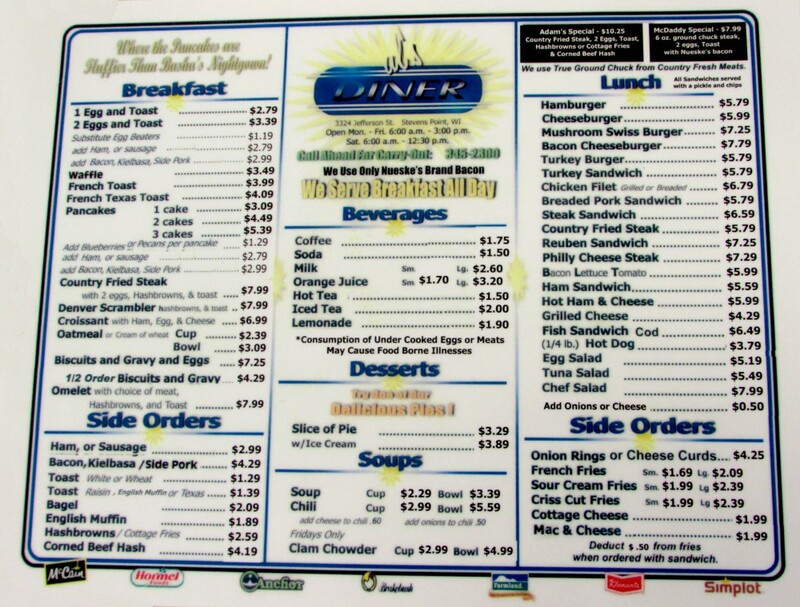 The menu, also the place mat! 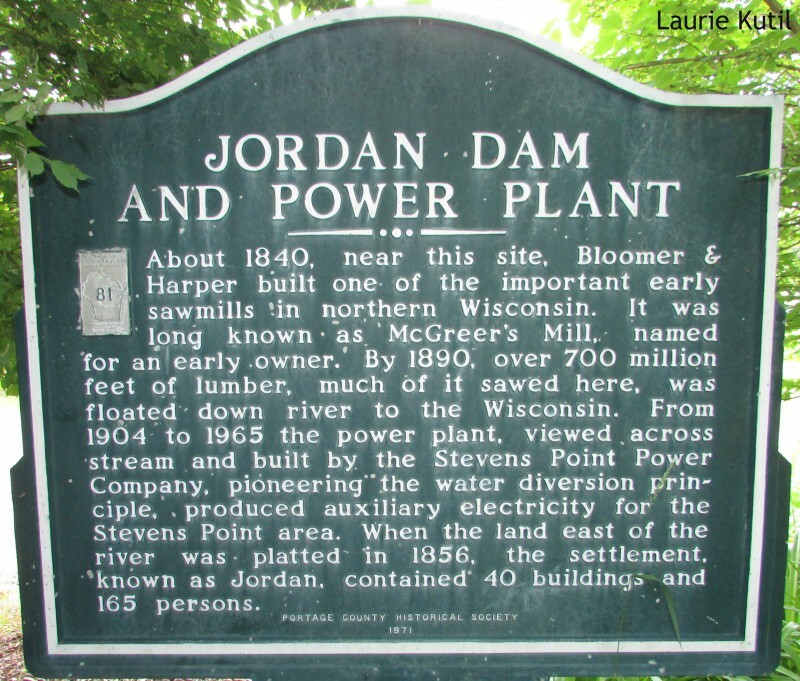 We saw one final marker before our visit concluded, the Jordan Dam and Power Plant and marker at Jordan County Park. It is a little hard to find, is was hidden by a large bush in a circle turn-around area. 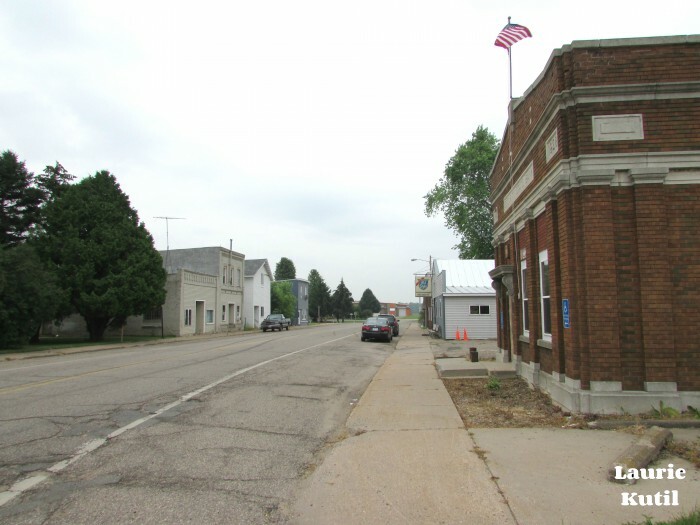 It is on the right side of highway 66 as you leave town. It was a great visit to Stevens Point , we are so glad we had a chance to look around! 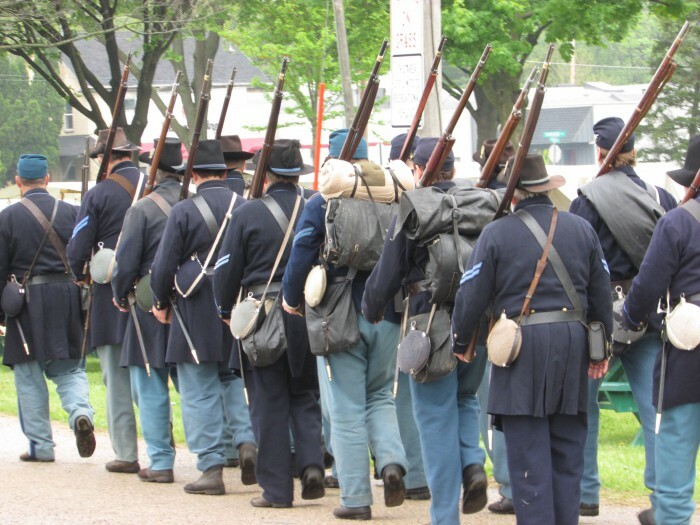 We attended Milton’s Civil War Reenactment and Encampment on this spring day. 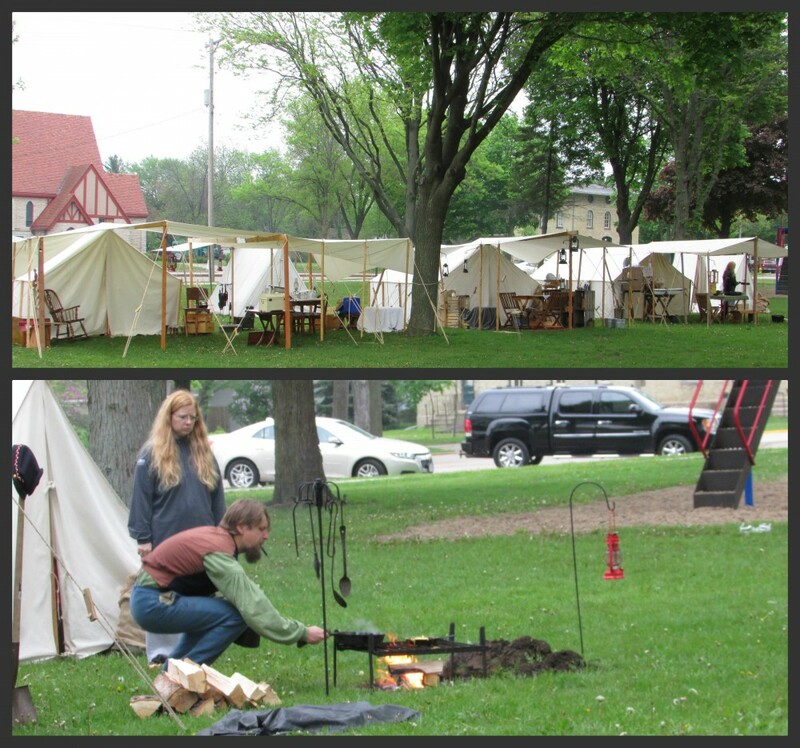 We enjoyed our first visit to Milton last year and thought we would enjoy going to this festival. It used to be in Evansville but now moved to Milton. 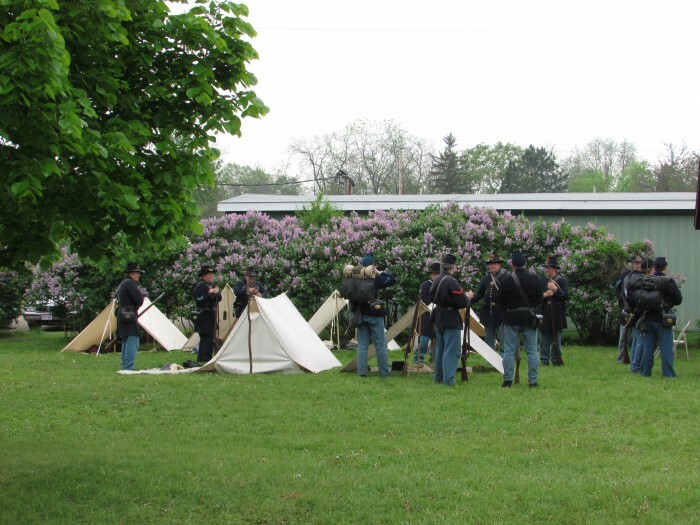 Some tents were set up behind the Milton House where the soldiers were mustering for battle at Milton College up the street. After lining up in formation, we slowly marched to the college. We arrived at the college, stopping many passersby in their track who may not have known about this event 🙂 Let’s watch some of their drills. After we enjoyed watching them practice, they posed for a picture by the Beloit College sign. We marched back to the encampment at Goodrich Park where activity was picking up. Someone was even cooking over an open fire. 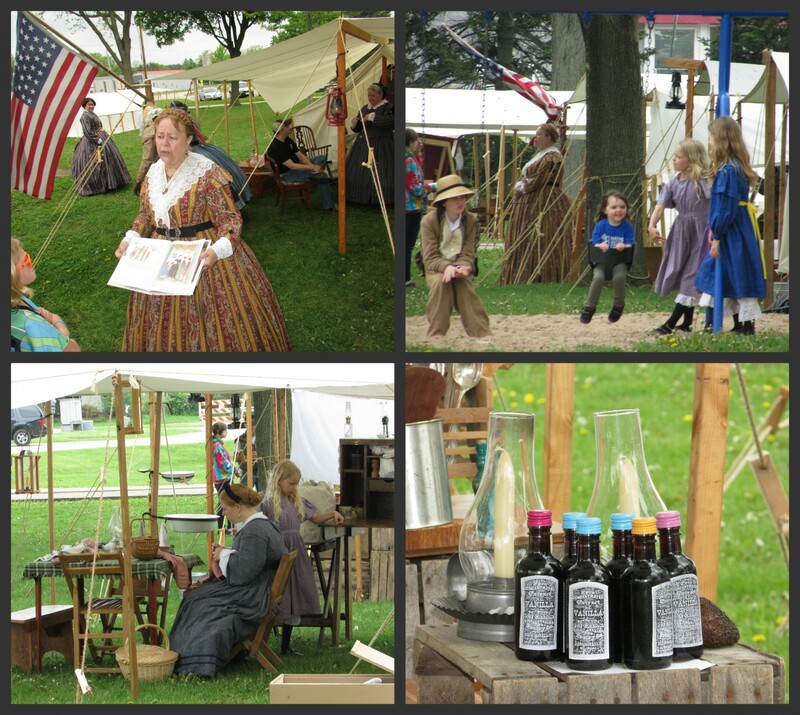 People in period clothing read stories to the kids about life in the 1860’s, children played in period clothing also. 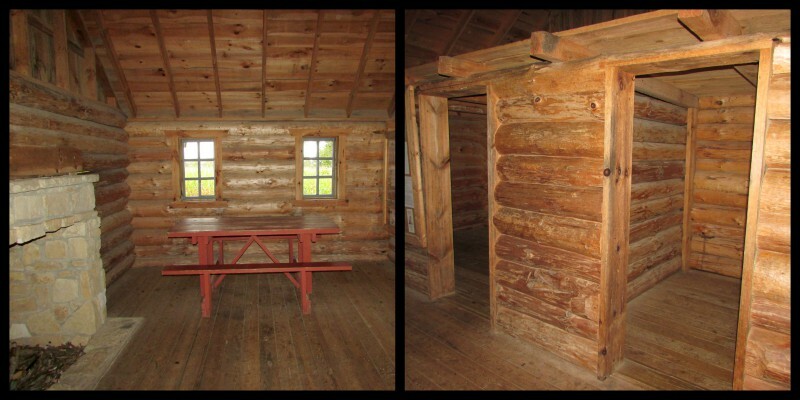 It was fun looking back in time, knowing the Milton House was a part of this scene then, recreated now. We saw a lady crossing the track in period costume. You could almost imagine it was a steam train instead of a modern diesel. Many trees in fact, grow in Brooklyn. The village of 1,413 is a designated Tree City since 2013. 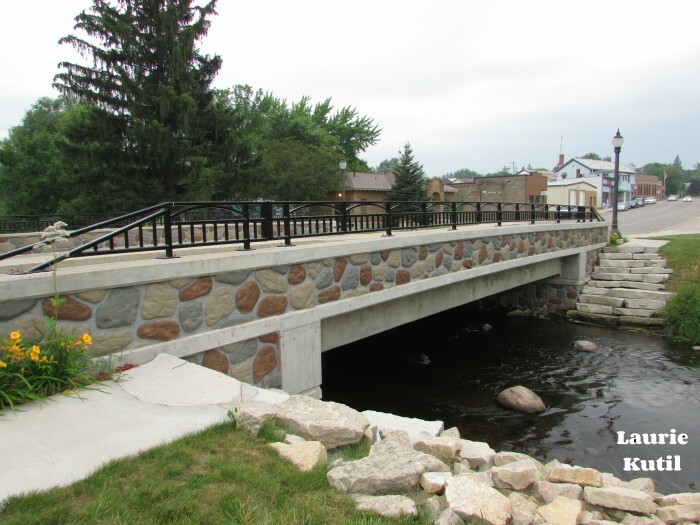 Located in both Dane and Green County, it’s a great place to visit close to Madison and Oregon. 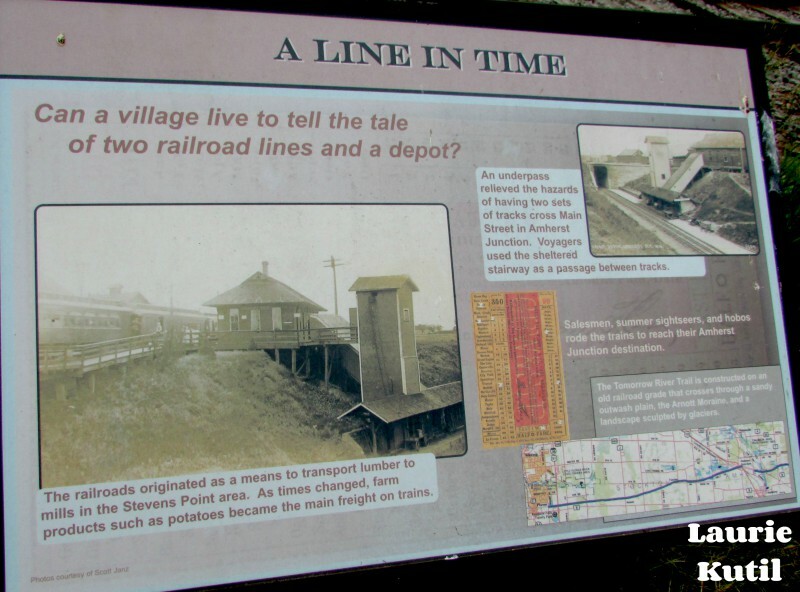 It was named Brooklyn by settler Hiram Capwell after he succeeded in luring the railroad to lay track through his property. 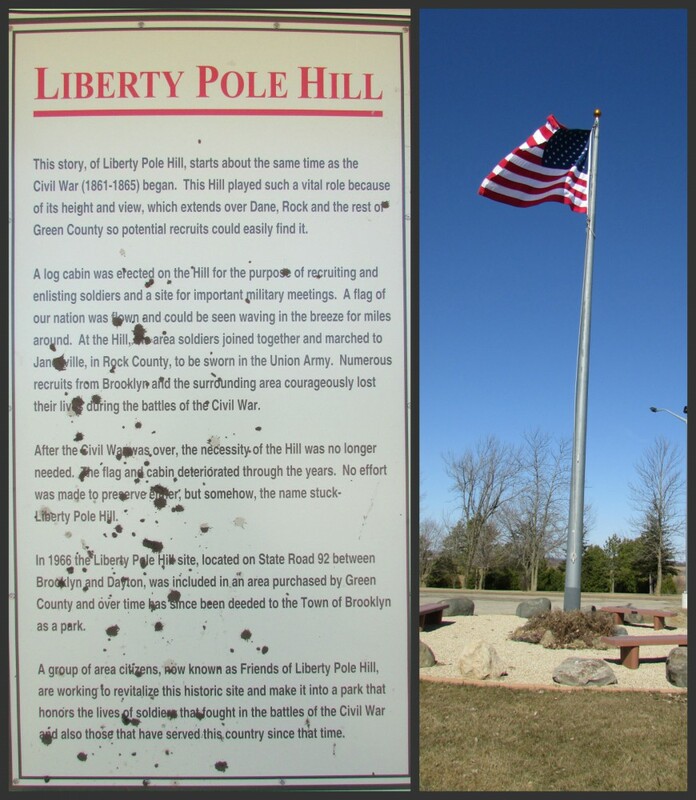 We first went to Liberty Pole Hill Park, a former Civil War recruitment site. 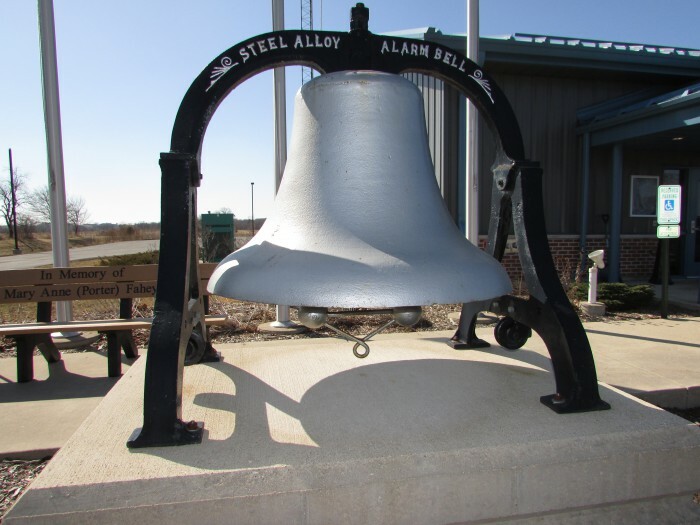 A historic bell can be found outside at the fire department. Edmund Andrews, a prominent businessman from New York, had the house built in 1976. It is on 100 West Main. Brooklyn used to be the site of the Capitol Chair factory, a stone building near the tracks behind the Edmund Andrews house. The structure still stands. 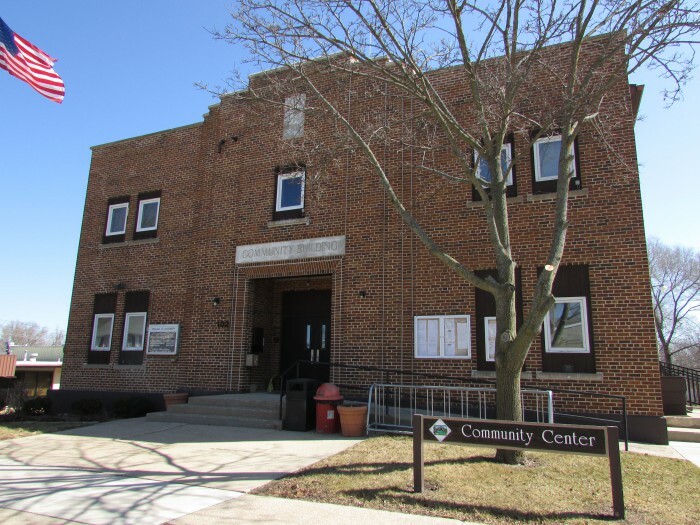 Brooklyn also has an active community center. 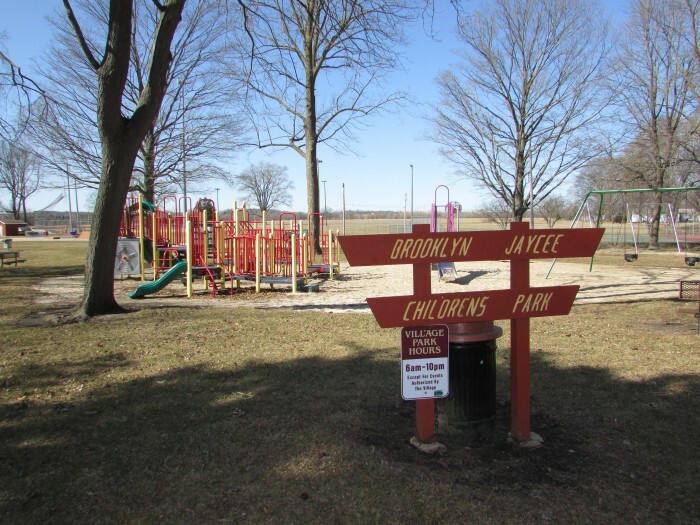 Downtown is the Brooklyn Jacycee Childrens Park, lots of fun for the kids! 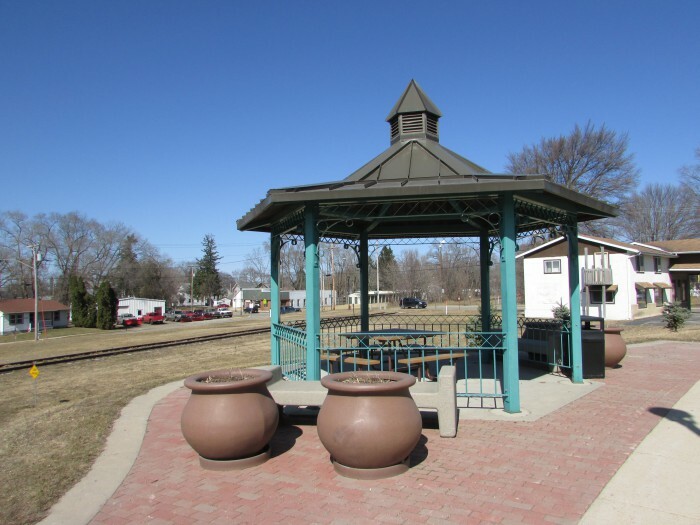 Not far from here is the village gazebo near the tracks. 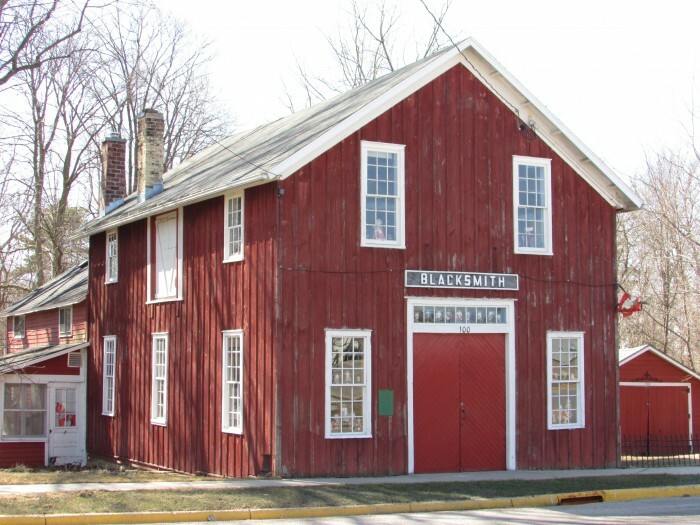 We also discovered the former blacksmith shop nearby. 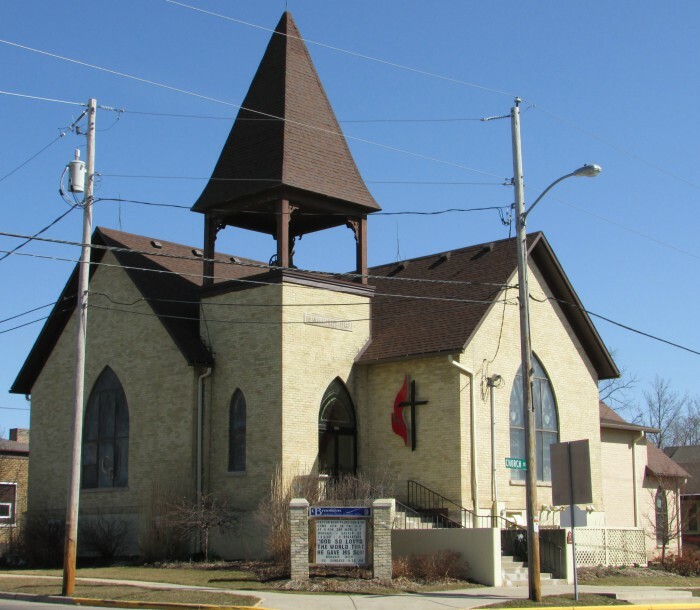 We tend to gravitate towards historic churches also. 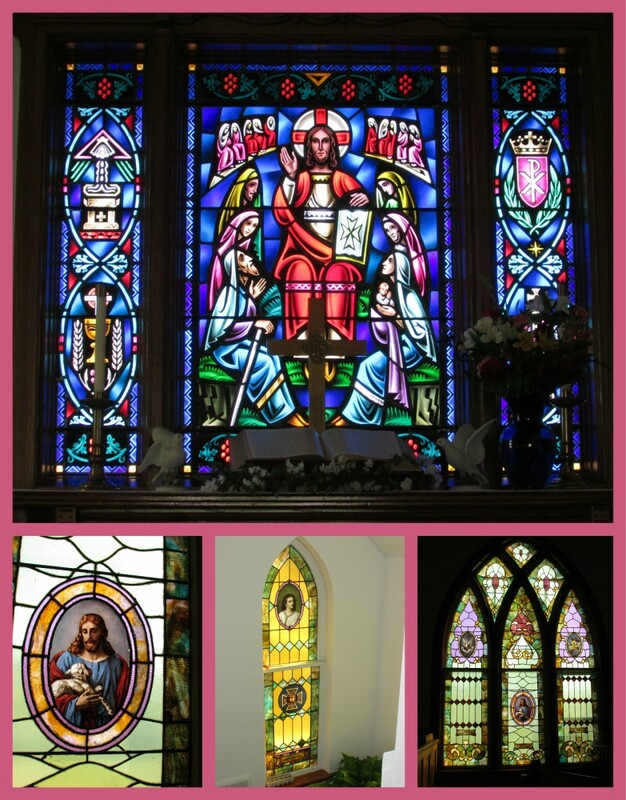 and the Brooklyn Community United Methodist Church has beautiful stained-glass windows. It was built in 1902. One of the ladies working there happened to see me admiring the church from the outside and invited me in to look around and to see the beautiful windows from inside. Thank you! 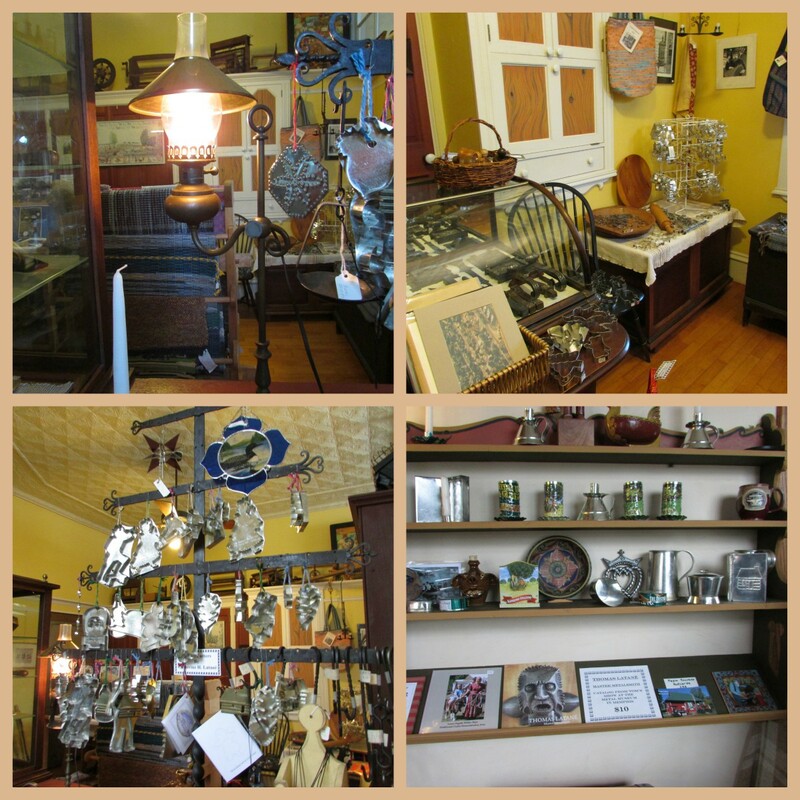 Shop at Market Place Trash & Treasures store for previously-owned items. Relax at the Anchor Club, open since 1949! 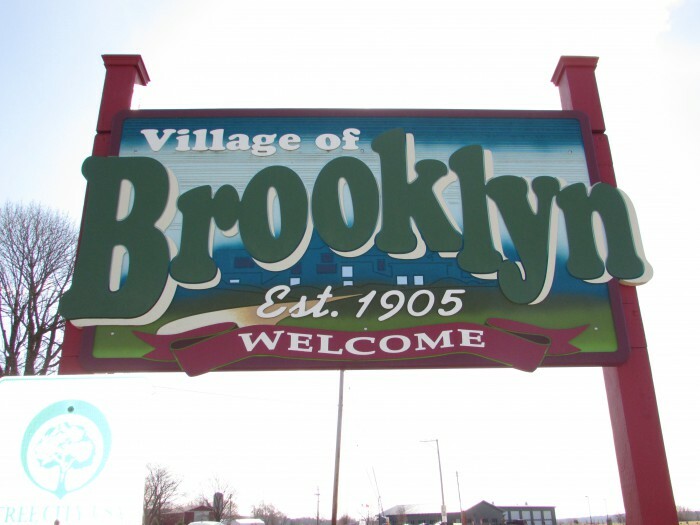 For a relaxing day in the country and lots of trees, come to Brooklyn!